Dalan and I joined a UNR (Univ. 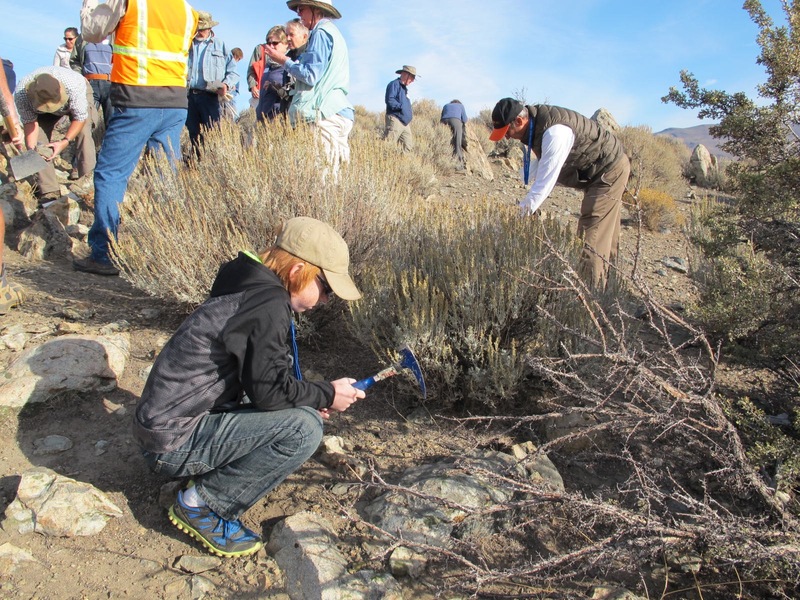 of Nevada – Reno) and Nevada Bureau of Mines & Geology sponsored tour in honor of Earth Science Week. We always want to learn more about our area and this was free, so why not? 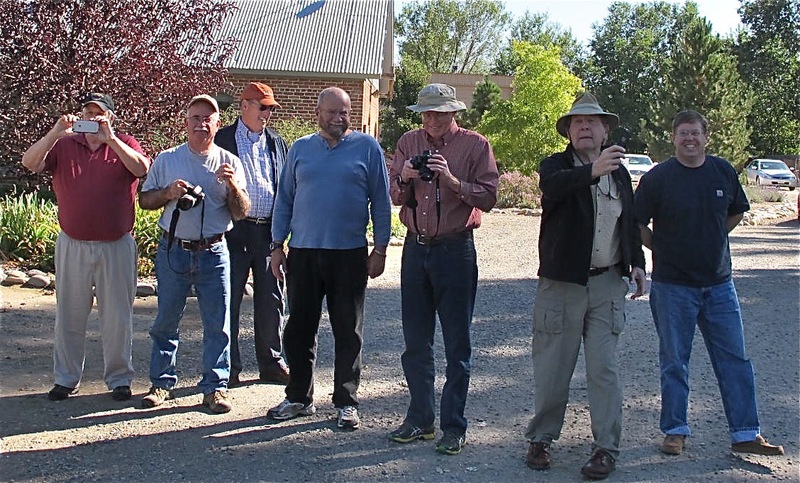 The purpose of the tour was to explore the interactions between Earth’s geosphere, hydrosphere, atmosphere and biosphere as we explored several sites around Carson City. 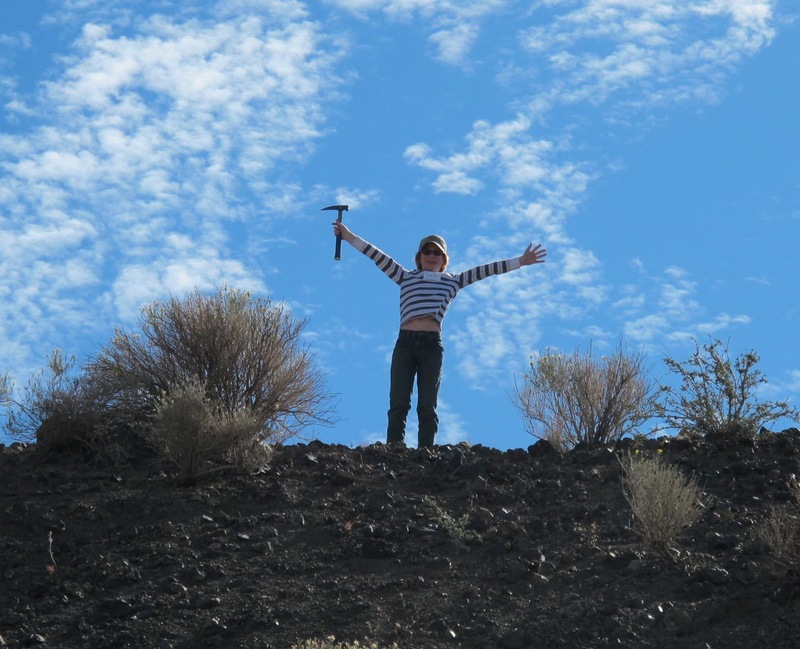 This is what we did …visited several sites where we examined and collected a variety of interesting rocks that help earth scientists explain the geologic history of the area. Dalan looking for the greenish epidote. Some epidote with tiny garnets mixed into it. About 50 people joined this tour, many with a lot of geologic knowledge. Dalan probably knew more than I. But I listened and learned a lot. Our first stop was Lone Mountain where we collected epidote, quartz and garnets. I learned that Nevada is one of the most seismically active states in the U.S. — second only to California in the lower 48 states. Historically, we have experienced a magnitude 7 or greater earthquake about once every 30 years. The last ones were in 1954 near Fallon. So I guess we’re due for a good one. A front was quickly moving through the area and the cloud formations were changing constantly. I thought this picture was pretty neat. There is even a tiny rainbow in the center left portion. 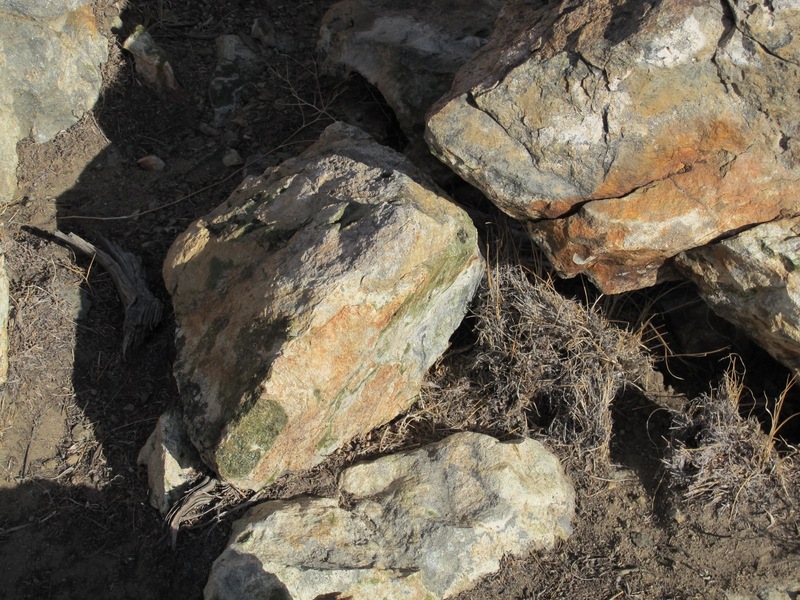 We went up into the mountains on the north side of Carson City where we espied 14 wild horses as well as many more rock samples. Some of the big boulders (called volcanic bombs because they were ejected quite a distance from the actual cone) pinged different sounds due to their composition. We thought that was pretty cool. 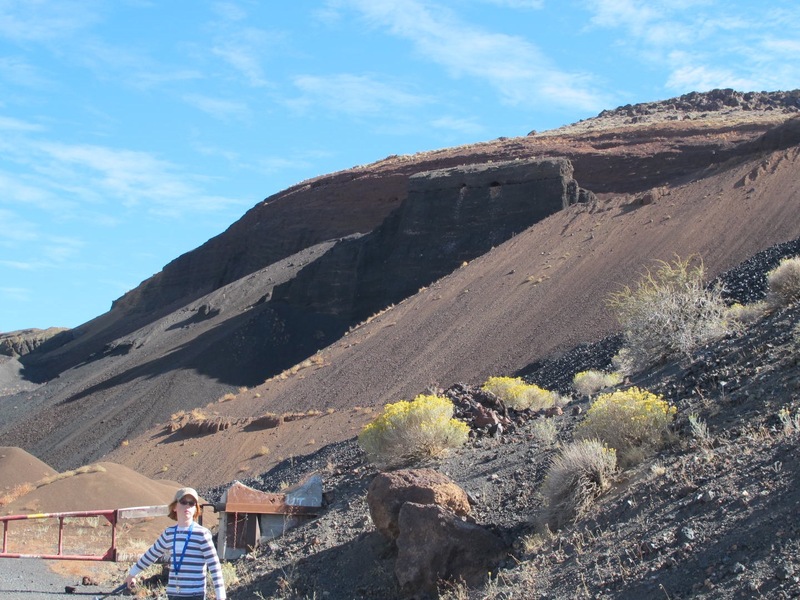 We visited a volcanic vent that is only 1.1 million years old (young geologically speaking) that is being worked by a company called Cinderlite. They use scoria, basalt and other cinder cone contents for landscaping jobs. Cinderlite realized that eagles were nesting in a couple of holes in the cinder cone and decided not to destroy that area. So now there is a large 100’ by perhaps 40’ by 100’ tall area where the birds are free to nest. I think that’s a nice gesture by the company. Dalan got a little bored with all the explanations and did some of his own exploring. He made me a little nervous climbing over many huge rocks, but he was sure footed and got to see more views than I did. One of our stops took us to a divide between watersheds. 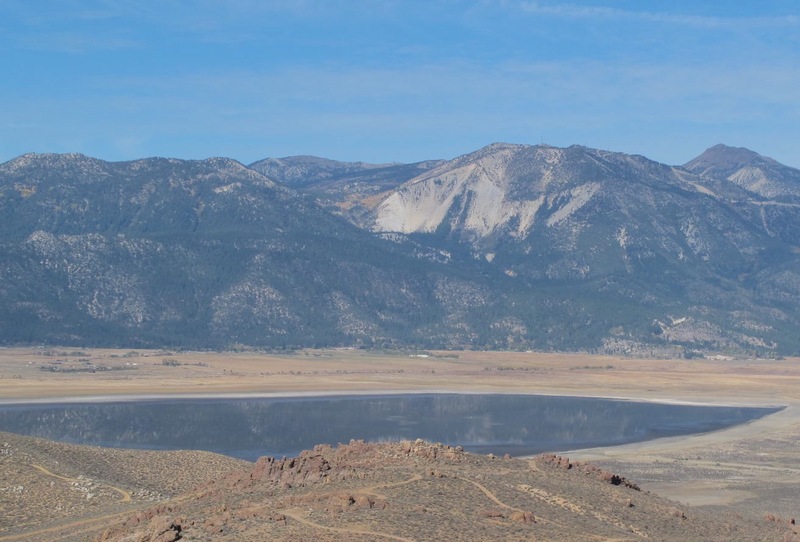 If you stepped to the right, the water drained into Washoe Valley. If you stepped to the left, the water drained into the Carson Valley toward the Carson River. I thought that was cool. Also in this area was what geologists call an “unconformity.” Basically, it is the contact between two rock types with a large gap in age. 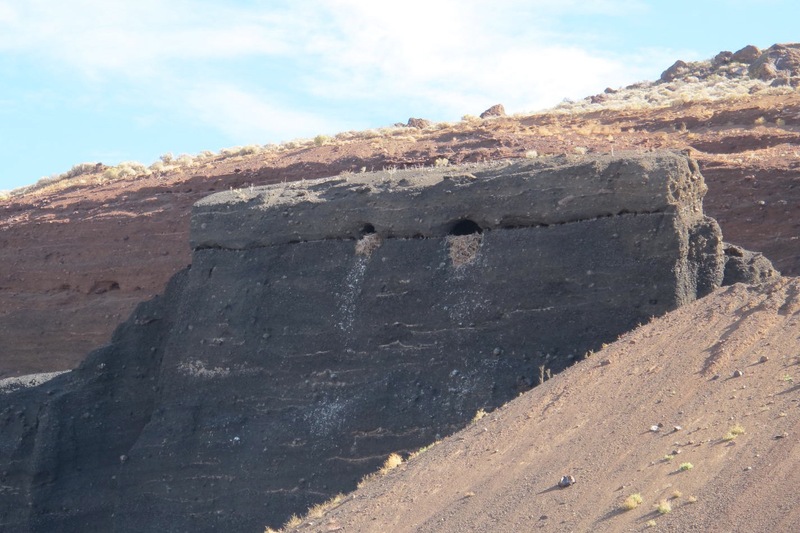 The granodiorite (GD) is about 100 million years old and the overlying basalt is about a million years old. I first heard of this in the Grand Canyon but never quite got the concept of it until now. I mentioned granodiorite. We know it as decomposed granite and it’s used a lot around here on playgrounds, in landscaping, trails and whatnot. As we looked west, we could see, obviously, the Sierras and some of the active fault system along the base of the mountains. We were told that as faulting progresses,, the mountain front steepens, the slopes become unstable and landslides occur. We can see that on Slide Mountain, the white spot in the center of the picture. A massive landslide happened there in 1983. Slide Mountain and Mt. Rose in the background with Washoe Lake in the foreground. 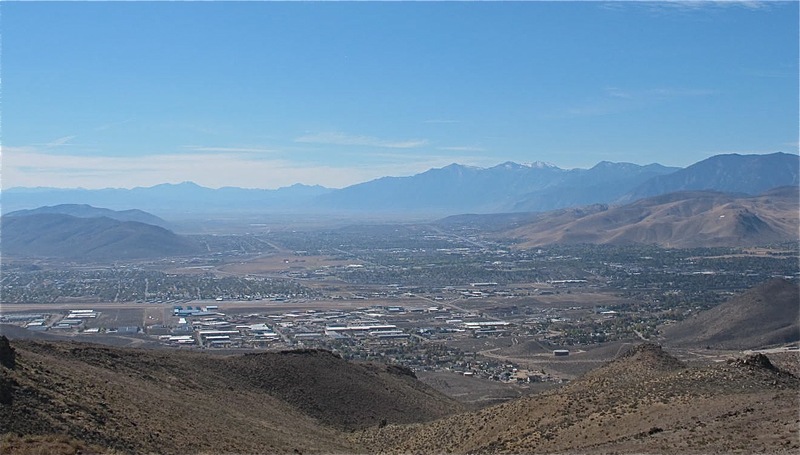 Carson City view from the watershed area. Again, I have probably made this too detailed and historical. I hope you haven’t been bored by these details. The field trip was very educational and fun to see things up close and personal. I hope they have another one next year during Earth Sciences Week. The photo above is the Prime Time Ensemble at The Farm. Note some differences…no beach in the background and spouses are there. As you can imagine, this was a fun, creative, amenable, and food/beverage-loving group. It was sort of like many different flower petals coalescing into a beautiful blossom. We all arrived and departed a various times on different days, but a good time was had by all. Diana and Jack, and son Jim are the most gracious hosts at an amazing home. Those who were not able to attend were missed very much and we all hope they will be able to join us at the next get-together. 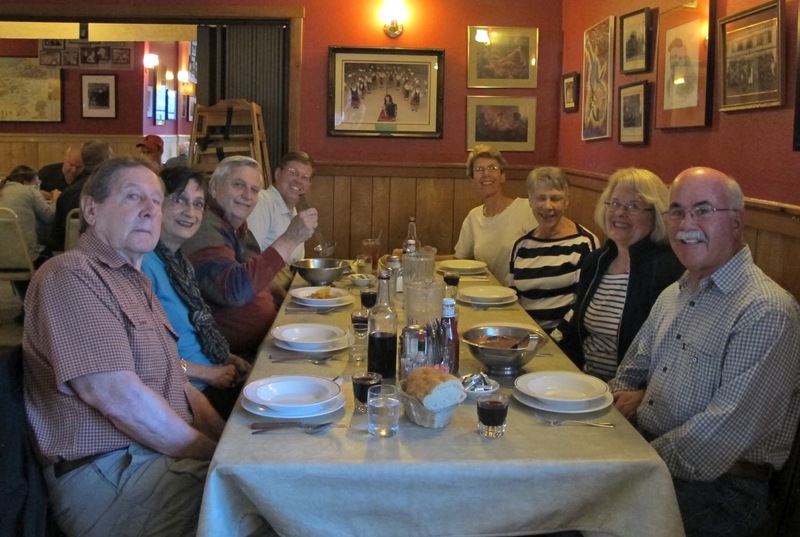 Several arrived on Monday, the 29th and we all had dinner at JT’s, a local Basque restaurant. Wow! This was my first time at this renown establishment and it was an experience. If you didn’t get enough to eat, it was your own fault. There were several courses served family style and then your entree arrived, just as you thought you couldn’t eat another bite. We topped that off with ice cream for dessert. Very tasty! A photo of the Monday night crew follows. Awaiting the scrumptious food at JTs. 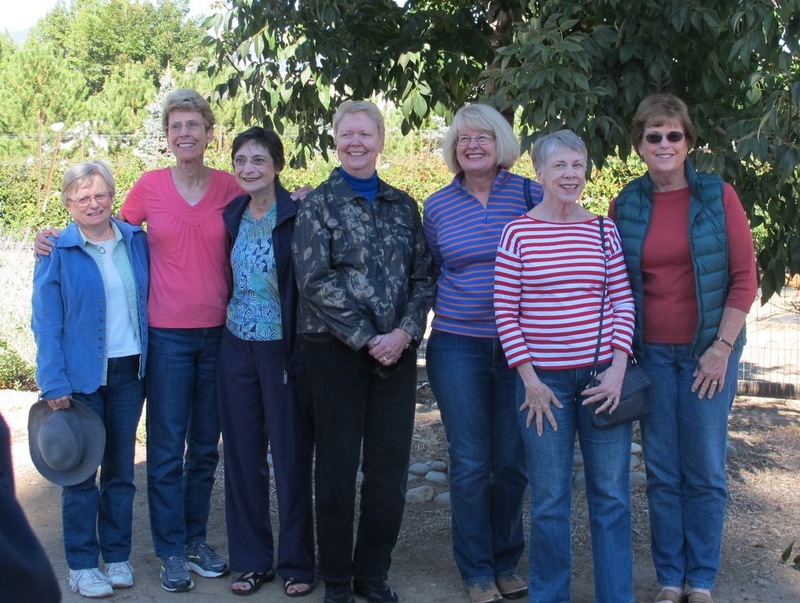 Dot, Bill, Lynda, Evert, Shoo and Alan arrived on Tuesday, making our group complete. Tours of the farm and Diana’s shop were given so that everyone would be on the same page when we were talking about things happening there. There was even a tour of my house because no one beyond Diana and Jack had seen it since the big move from Cerritos. 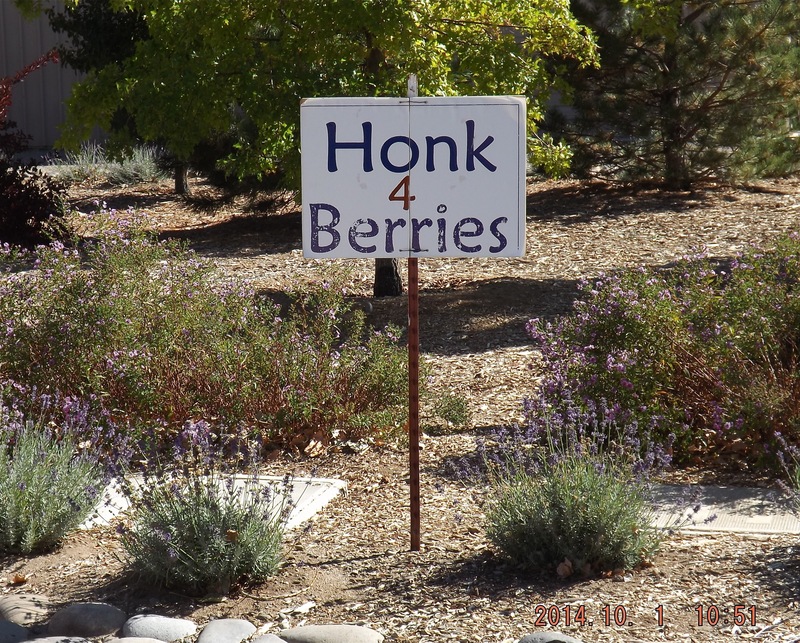 These are the BEST berries I have ever tasted, bar none. YUM!!! As we do at Pajaro, we chatted, snacked, imbibed in some wine and other spirits, chatted some more, walked, ate great meals. Steve Brock even cooked pancakes for breakfast one morning! The men all pitched to help prepare food, clean up and pour wine. It was a very cohesive, amiable group that created a lot of fun. 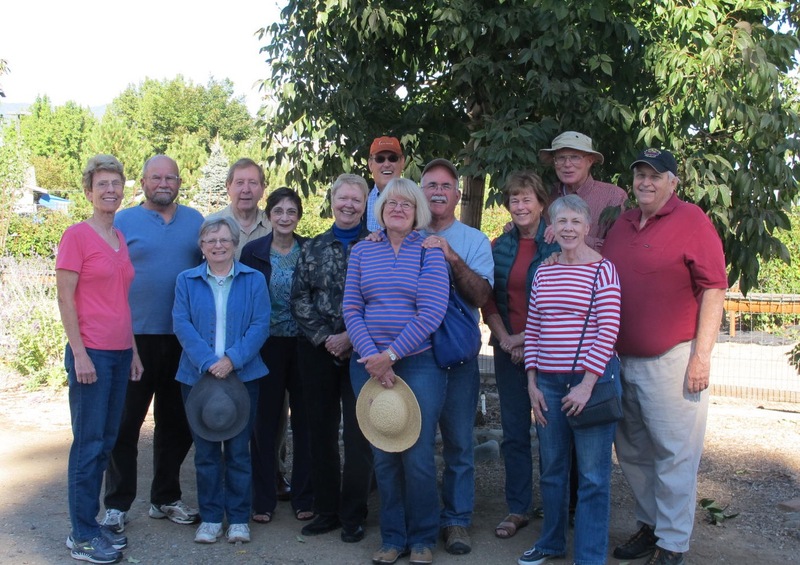 Jack and Diana like to take group shots of visitors to the Farm and, of course, we all complied with that wish. I think that Jack felt it was like herding cats to get us all organized, but we eventually got some good pictures. The opening shot is of the entire group and then we have one of the OHS coeds. We felt like celebrities with all the cameras clicking. We tried to get a shot of just the guys, but they were busy taking pictures and messing around. I tried to get a shot of all the guys taking photos and took about 10 shots. But in every photo but one, Steve was trying to get his phone set just right. Genoa tourists waving at cute guys! 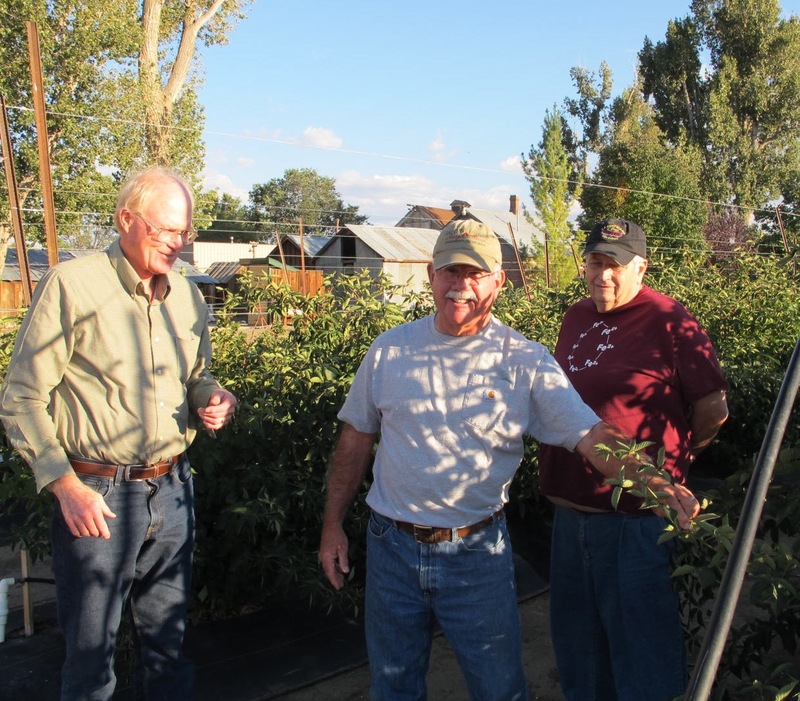 We took a field trip to Genoa, Nevada’s oldest settlement, to take a nice walk and check out the shops, particularly the oldest thirst parlor in Nevada. Actually, we just looked in the parlor and took a hike to Walley’s Hot Springs and Resort. I had been told that it was only a mile from Genoa, but it turned out to be our total trek amounted to a bit more than 3 miles! 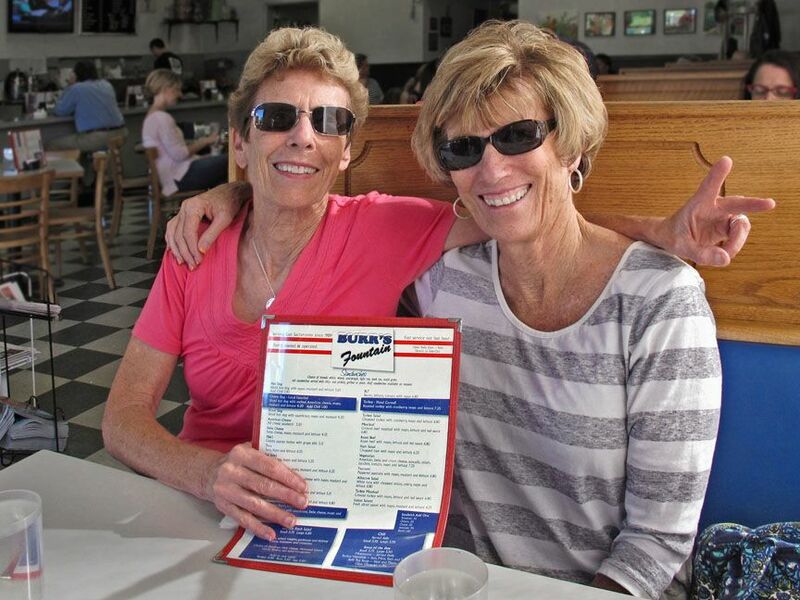 Needless to say, some of our party became parched and we had to take a break at Walley’s for thirst quenching and nourishment. Then a few folks found the ice cream portion of the Genoa General Store. No one went hungry (as usual at our gatherings). Lynda prepared pizza for us that was delightful and delicious. We all enjoyed her biscotti as well. Two more YUMS! 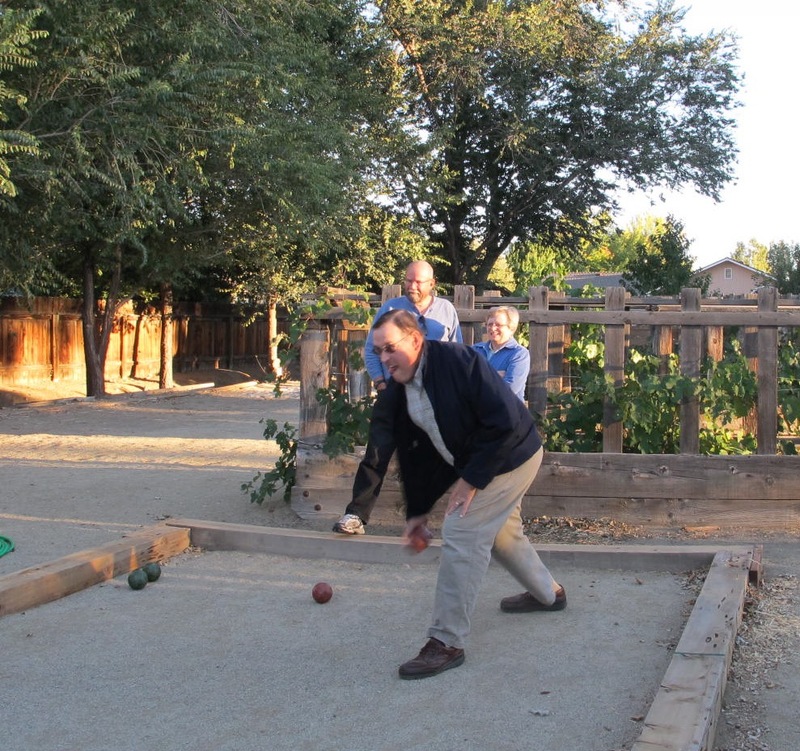 While Lynda’s pizza crust was being prepared, most of us went to try our hand at bocce ball. There was spirited competition, but I don’t think a clear-cut champion was determined. We’ll have to reconvene again to determine that. Our party began to break up with the departure of Trish and Steve that night, then with Sherry, Howard, Shoo and Alan the next morning. The remaining seven decided to go on a jaunt to Blue Lakes that is off of Hwy. 88 in California. Such a beautiful place! We enjoyed a great picnic until the camp host kicked us out for picnicking in an area that was not for day use. There were no other campers but rules are rules, I guess. It was nice, though, that he didn’t disturb us until we had finished eating. So we left and found another area right next to one of the Blue Lakes. 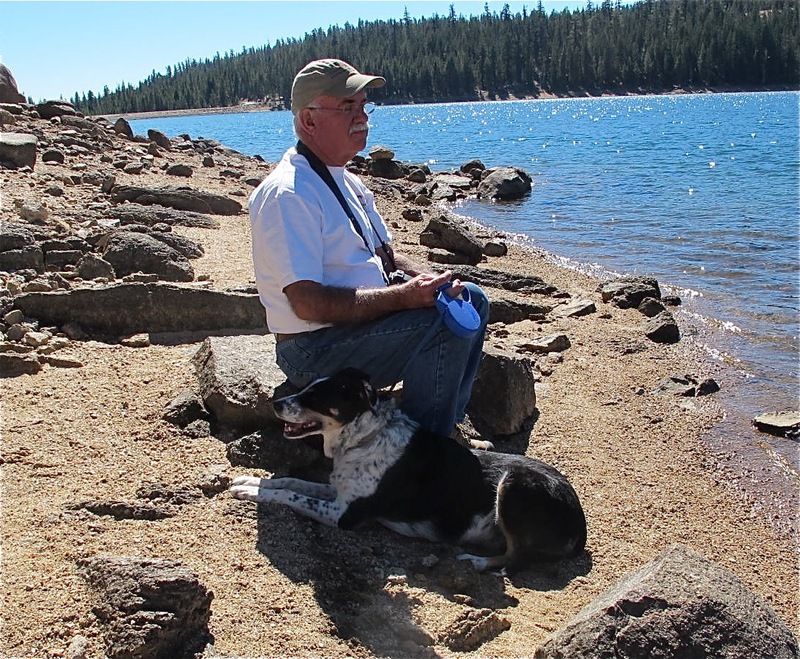 Man and dog… Lucy loves Jack! And then there were five. 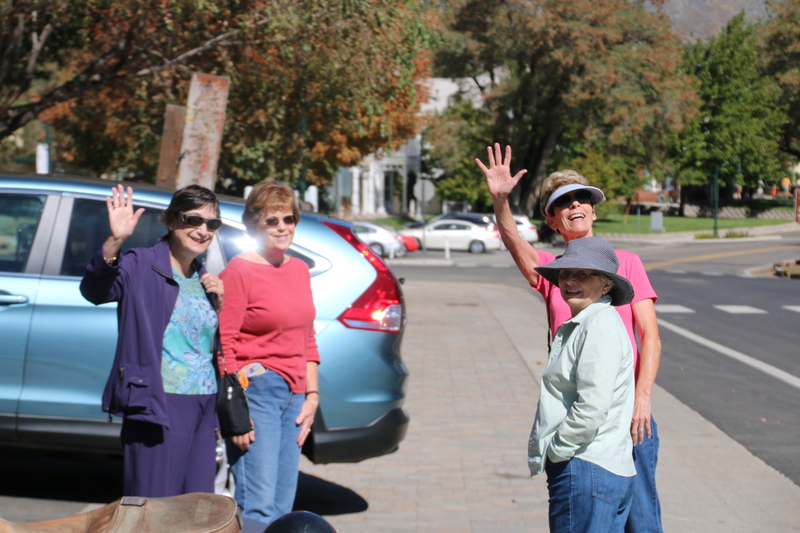 Lynda and Evert had to leave us after we frolicked at the lakes and the rest of us headed on back to the Farm, but not before a little side trip to Markleeville,, CA, population 210 and Alpine county seat. Markleeville is very small but it sports a shop that serves tasty ice cream cones. We definitely checked them out. All good things must come to an end and so our gathering did that Friday. Diana had to go to work at the shop; Jim was in the Bay Area; Jack had things to do; Bill and Dot had to fly home and I took them to the Reno airport and eventually got back to my little black cat, BC. (who told me quite vehemently that she was lonely!) What a great time! It was fun being with a larger group that meshed so well. We had planned on taking our Boston trip in 2013 but we felt it was best to delay it for a year due to my move to Minden. It was worth the wait as we had a great time exploring the cradle of the American Revolution. 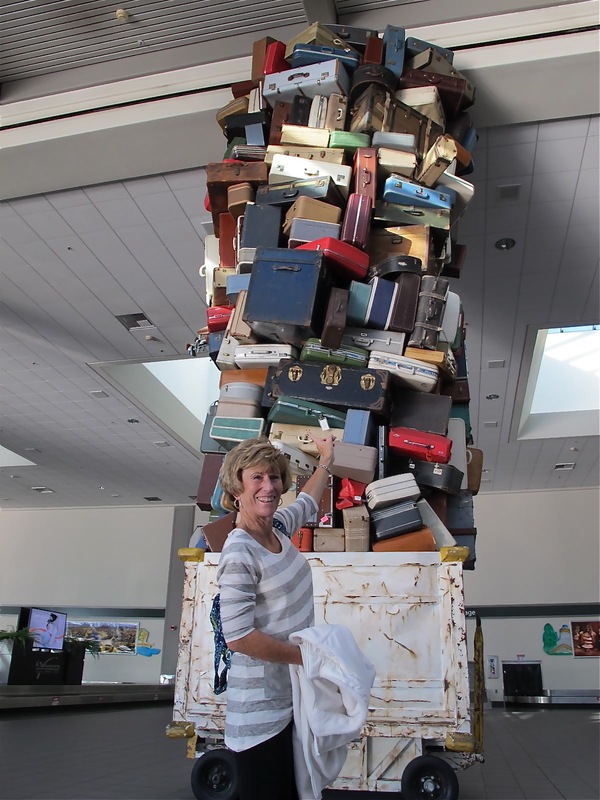 The flight was good and we got to our hotel safely. No room was available at 6:30 AM, so we ate breakfast there and figured out what we wanted to do that day. Our first impression of Boston was that of a cacophony of sirens and horns, along with crazy pedestrians and VERY aggressive drivers. That impression didn’t change in our three days there. But that’s not to say we didn’t enjoy Boston. It was great to be immersed in so much history and east coast culture! AND a lot of people were very helpful to us in finding our way around. We also enjoyed the food…fancy and plain. 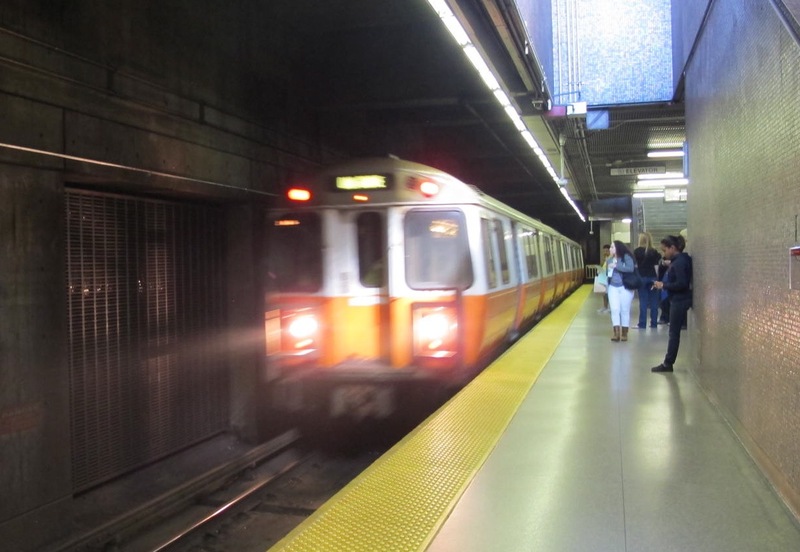 We learned how to ride the T (Boston’s subway system) and then took a tour on one of the many tram/bus excursions. 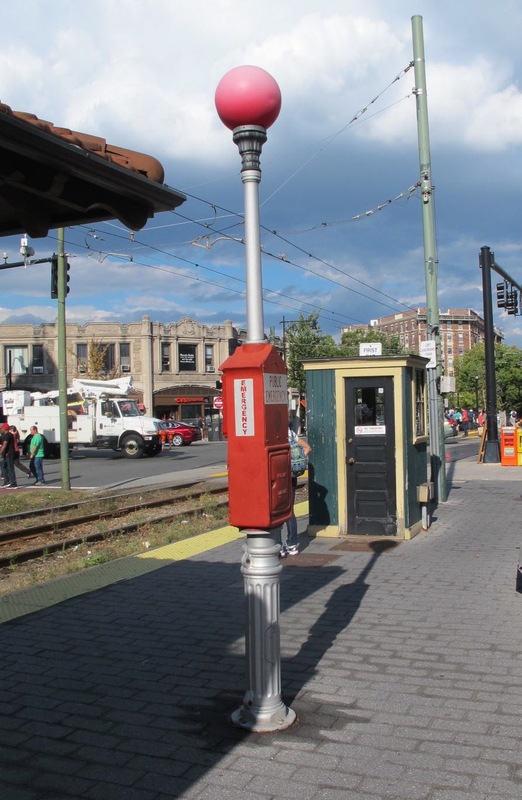 It was a great way to get acquainted with Boston and we enjoyed being able to get off and on at designated stops. Our first stop was at the Charlestown Navy Yard where the USS Constitution is moored since 1897. 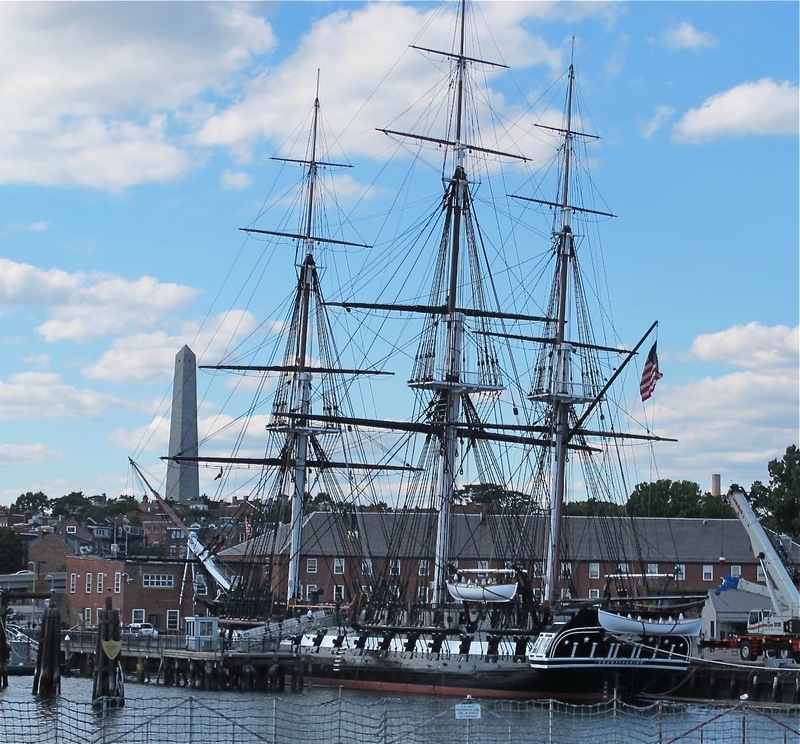 We first visited the USS Constitution Museum and learned quite a bit of history about the Naval Yard and life aboard a naval vessel. 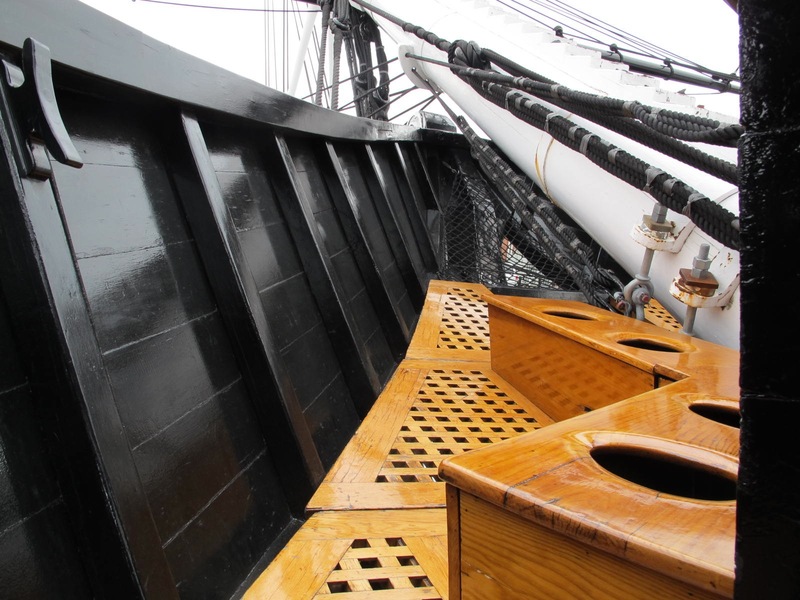 The highlight was actually getting to go aboard “Old Ironsides,” our country’s oldest commissioned warship. Real U.S. Navy folks were stationed on board to answer questions and explain things like using a hammock to sleep in or how they drank their grog. (The sailors were issued a set amount of grog each day and had to drink it in front of the person who doled it out to make sure they didn’t get more than their allotment) I asked about the heads (bathrooms in sailor talk) and was told there was actually an open-air place at the head (bow) of the boat with commodes to sit on. It must have been awfully cold and uncomfortable in poor weather. After our tour of the Constitution, we elected to walk to the Warren Tavern (1775) and enjoyed some delicious clam chowder. We walked to the Bunker Hill Monument, which commemorates the Battle of Bunker Hill that was actually fought on Breed’s Hill because it had a military advantage. This was the battle in which the immortal words, “Don’t fire until you see the whites of their eyes,” were uttered. We attempted to climb the almost 300 steps to the top, but we pooped out at 100. The fatigue from the flight and lack of sleep was caught up with us. 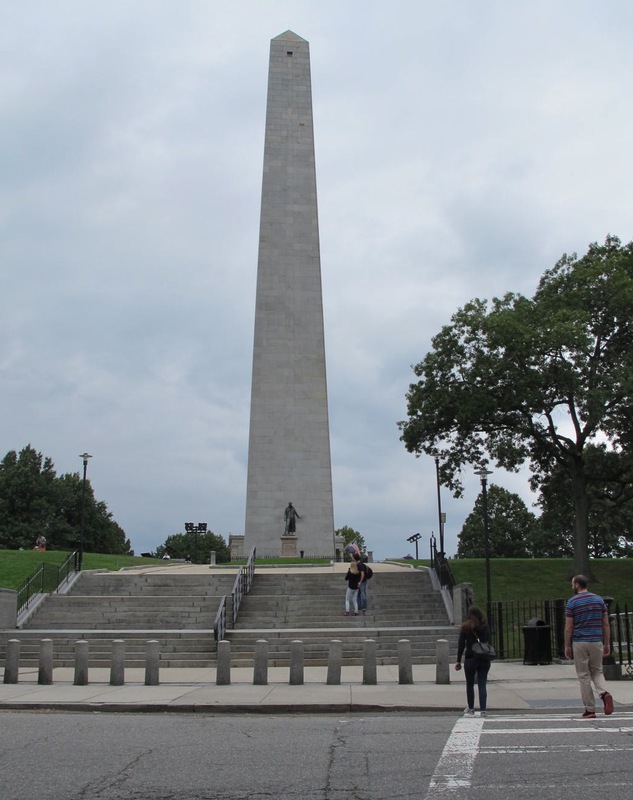 Bunker Hill Monument – very similar to the Washington Monument in D.C. 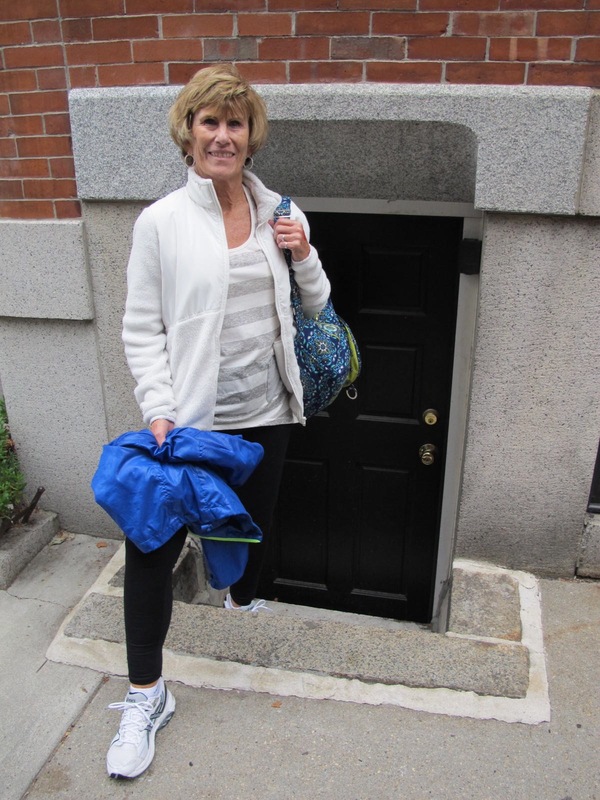 While on this little side trip, we noticed a lot of “Hobbit” doors at ground level of apartments/flats. I assume these are for storage, but I prefer to think that many hobbits live in Boston. A Hobbit door. Jerri was not invited in. Day Two saw us getting a day pass for the T and we buzzed along just like pros. We emerged from the T right at the State House, the seat of colonial and state governments as well as a merchants’ exchange. 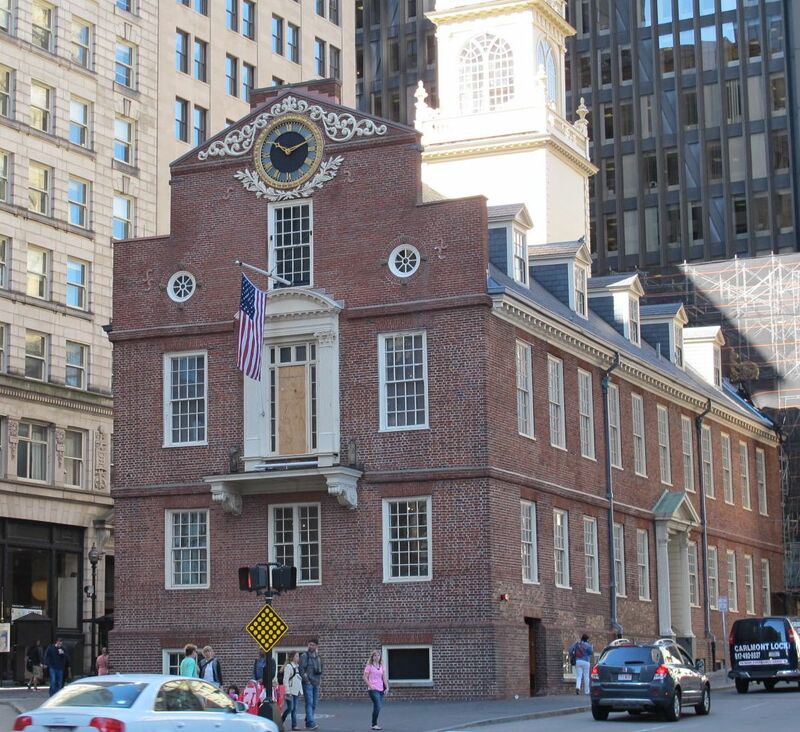 The Declaration of Independence was first read publicly from the State House balcony on July 18, 1776. Part of it was undergoing reconstruction, so we didn’t partake of the tour. From the State House, we went to Faneuil Hall (AAA says it’s pronounced “fannel,” but I kept hearing something like “fanuel”, similar to “Samuel.”) At any rate, it’s an interesting place. It’s an old market built at the site of the old town dock (it’s amazing how Boston’s shoreline has crept out over 250+ years). Town meetings, held here between 1764 and 1774, heard Samuel Adams and others lead cries of protest against the imposition of taxes on the colonies. Many market stalls are on the first floor just as they were in Paul Revere’s day. There are also many, many stalls and restaurants on the outside of the building…a very interesting place to visit and shop. 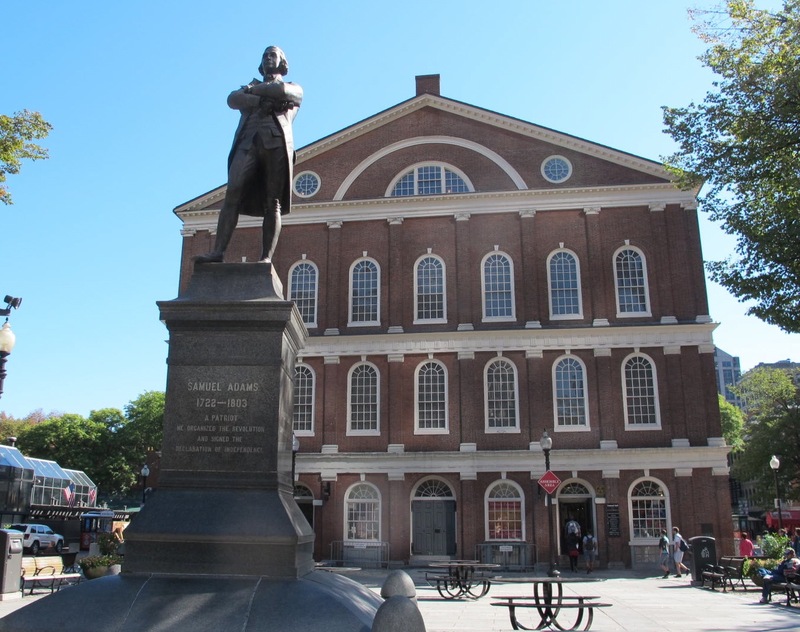 From Faneuil Hall, we began to follow the Freedom Trail, a three-mile trail that begins at the Boston Common and ends at Bunker Hill. 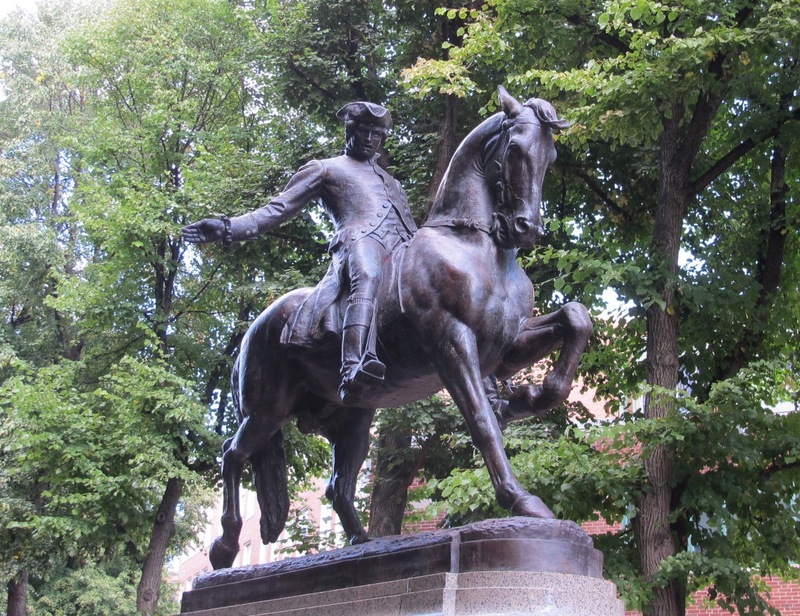 It allows one to discover a Revolutionary past that is embedded in modern Boston. The Trail is marked by a red line (generally red bricks) and is easy to follow. Markers such as this one are by each historical site on the Trail. Actually, the Trail is a Godsend for people like us who don’t know their way around Boston’s little curvy streets that don’t seem to follow a general north-south grid like many of our streets out west. 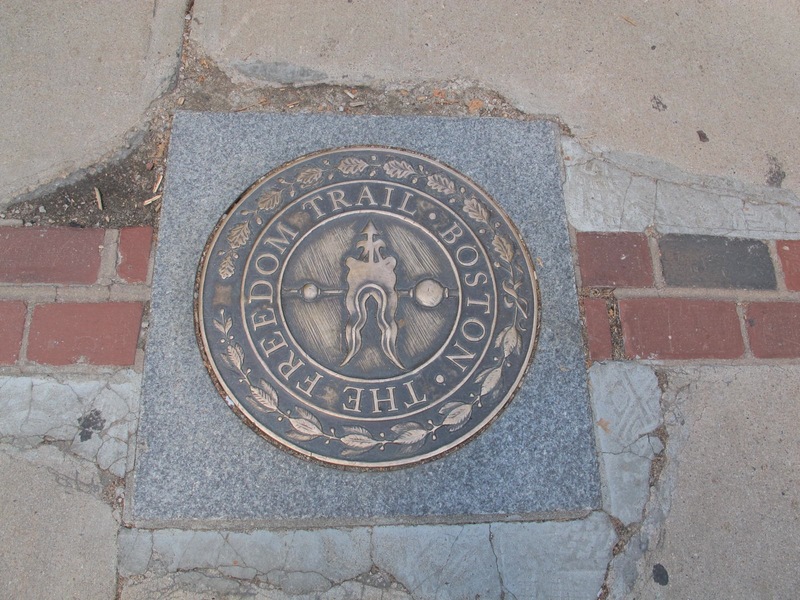 You can see the bricks emanating out of the Freedom Trail marker. Paul’s house is the gray one. You can see the cobblestones still on this street. 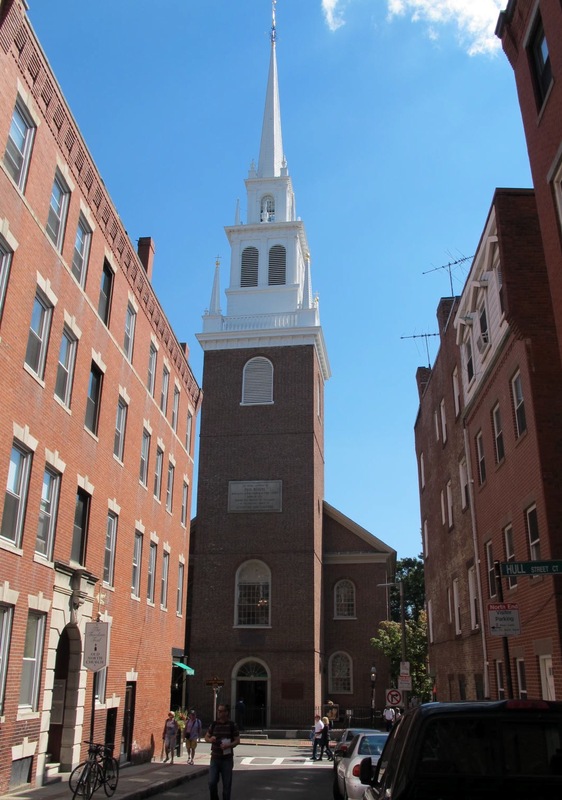 What would a visit to Boston and the Old North Church be without a picture of Paul Revere on his house riding out to alert the colonists that “The Regulars are out!” I always thought he said “The British are coming,’ but at that time, the colonists still considered themselves British. We learn something every day. Revere’s statue is in a courtyard/alley behind the North Church and we walked around the church to get this view. Its spire is very imposing and I can see why it was chosen to give the alarm. One can still see it from many parts of Boston. 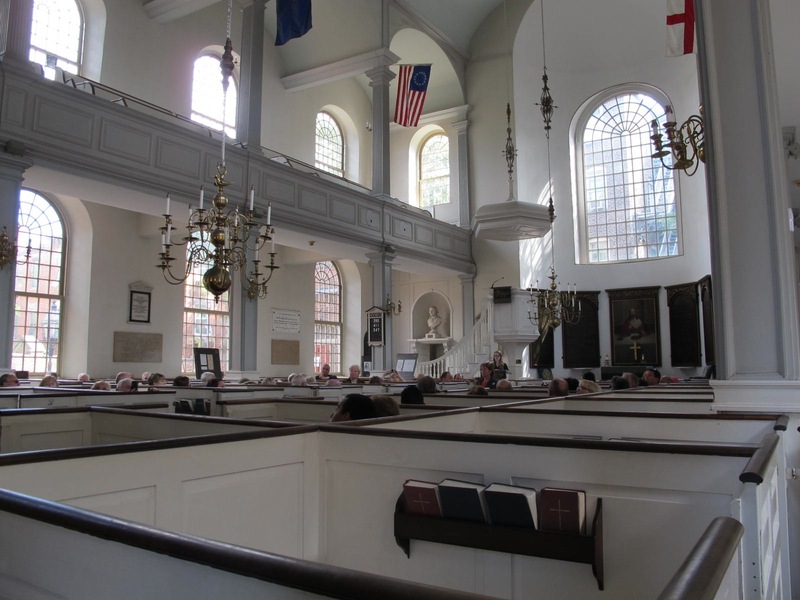 Built in 1723, it is Boston’s oldest church building and remains an active Episcopal Church. It still sports the individual family pews that a family could “decorate” with pillows, cushions and/or comforters in the winter. It was lunchtime when we left Copp’s Hill and began to retrace our steps to follow the Freedom Trail. We had been noticing many people carrying huge slices of pizza, which all smelled very good. 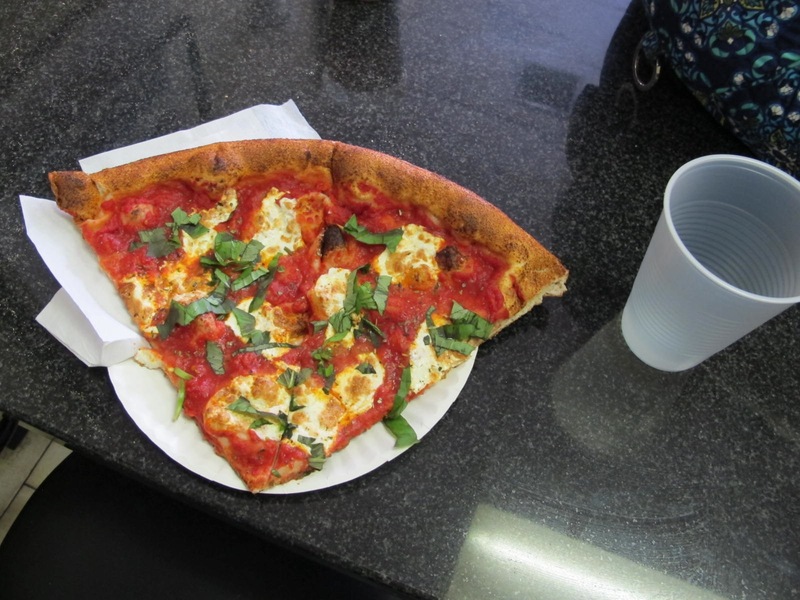 We finally discovered Ernesto’s Pizzeria and enjoyed the cheapest meal we had in Boston. Check out this serving for $4! It was very tasty and filling! This was a great lunch…and very filling! Throughout our trip, we noticed street and other signs that are very different from what we have here in Nevada. For example, we’d be driving along and notice a highway sign that said “Blind Child,” “Handicapped person” or “Elderly-Slow-Complex.” We know for what they are intended, but it’s just different. Here are a couple of others that we saw. The “Nut Roasters” struck us funny as did the mutilated T sign telling where to go to catch the T to “A Wife.” Alewife is a Boston suburb and the name is for a herring fish that is in the ocean and some rivers. 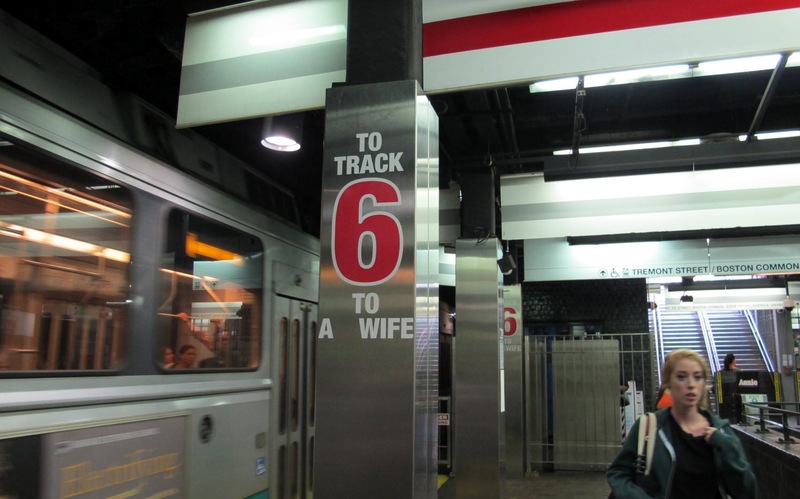 Great place to find a wife! 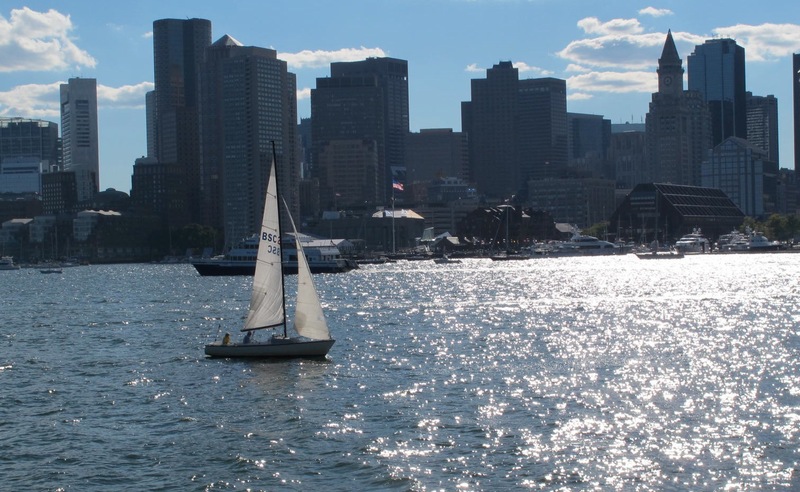 We took a harbor cruise that gave us some pretty skyline vistas of Boston as well as a stern view of the USS Constitution. It was tough to get pictures other than silhouettes because the sun always seemed to be in the wrong position. Oh well, at least we got to see these things and enjoy them. Because of the cruise, we ended up joining rush hour on the T. Oh my goodness! We had experienced something like this in Washington, D.C., but this had it beat. Talk about being packed like sardines! We survived and tried not to repeat it again the next day. We bought another T day pass to get out to the JFK Library and Museum and then do some other visiting to historical places. The library is located on the University of Massachusetts campus and we were joined by many students commuting to their classes. It was kind of fun to be with them. They didn’t pay us any mind, though, because they were all on their phones or tablets communicating in one way or another. None of them talked. It is an amazing thing to watch. But, then, I’m old fashioned and sometimes out of step. This is the Orange Line arriving to take us to transfer to the Red Line. It’s not crowded here because it’s between rushes. We enjoyed the library so much that we decided to take the T to Brookline and visit JFK’s birthplace. The house is now owned and operated by the National Park Service. 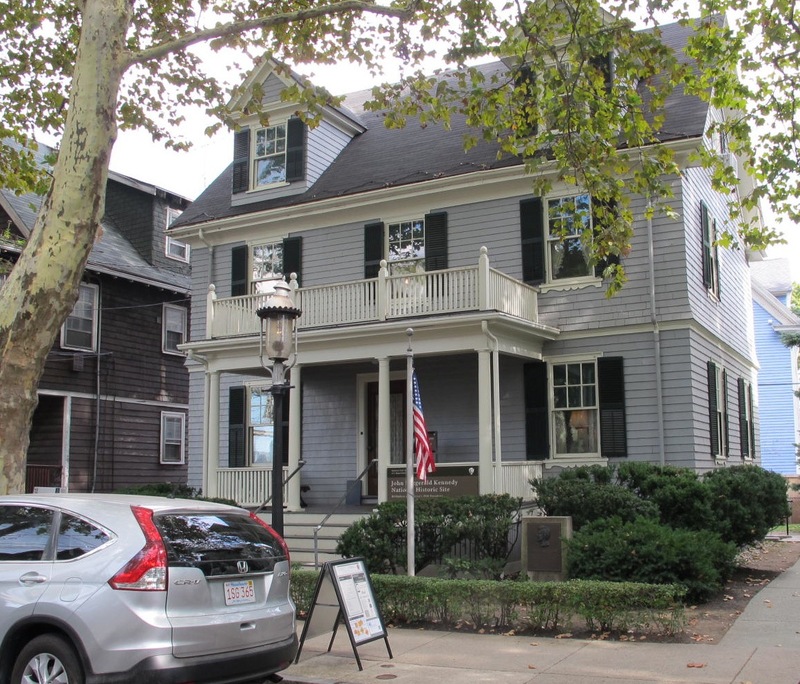 JFK’s parents moved there in 1914 shortly after their wedding. They called it a modest house, but it had more than 2000 square feet with room for servants on the third floor! It was one of few houses on the street and the Kennedy children could play outside to their hearts’ content. The family lived there in this very ordinary neighborhood before moving in 1920 to a larger house to accommodate a growing family. The new house was just about a mile away from this house on Beals Street. Since it was nearing dinner time, we opted to go back to downtown Boston (since we had to change T Lines there anyway) and have dinner. 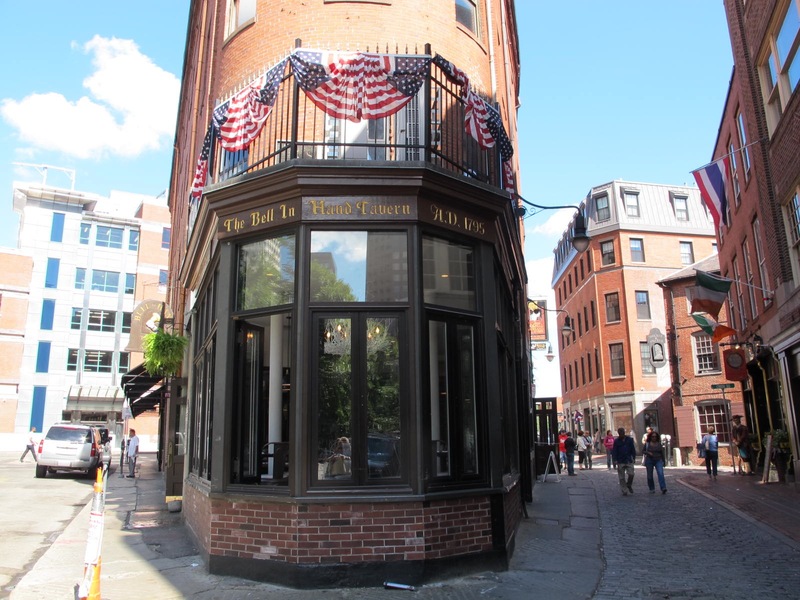 We chose to eat at the Bell in Hand Tavern that we had seen before on the Freedom Trail. It looks like a skinny building, but it stretches back into the building, thus giving it quite a bit of dining/bar space. Jerri had a salad with steak tips that were huge. It was quite a tasty dinner. Mine must not have been so good as I don’t remember what I had. The Bell in Hand Tavern. There really was a large sculpted bell in a hand inside. You can see that there is an alley to the right of the tavern. 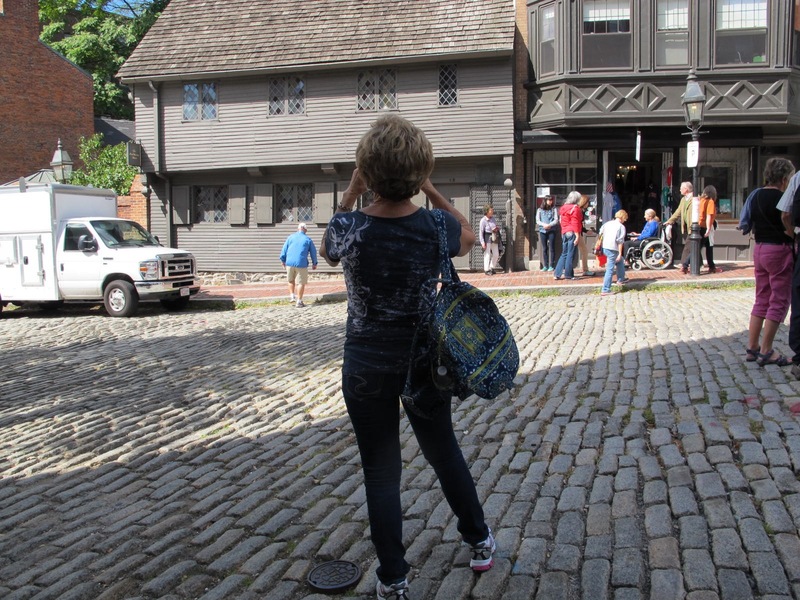 The Freedom Trail is in that alley and there are several taverns across the alley as well. We happened to espy Ben Franklin chatting up tourists, especially the young women. 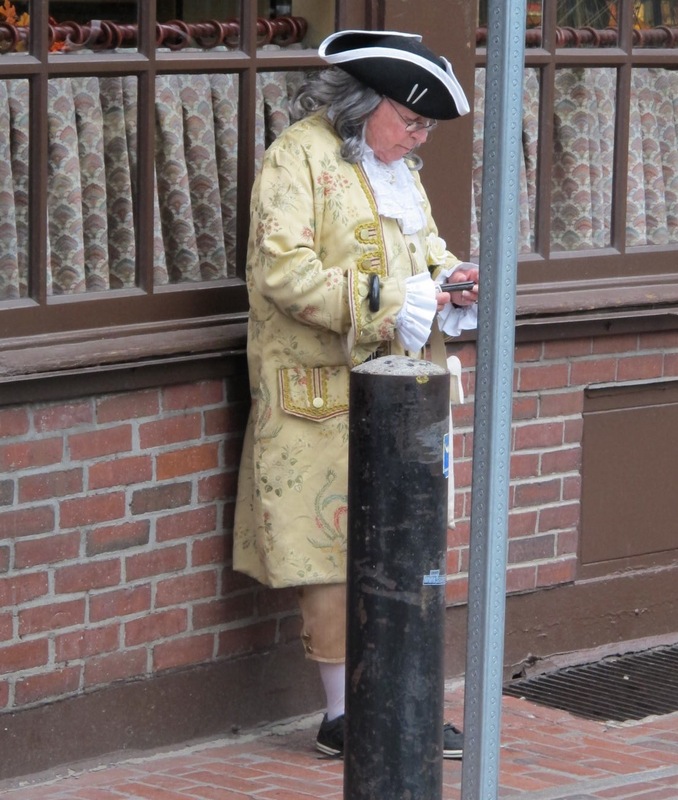 It amused us greatly that he remained in character until everyone had left, then he pulled out his cell phone to check for messages. Right after that, he reverted back to character and strolled into a tavern. Ben Franklin – ever a modern man! Note his shoes and socks as well as his phone. These fire alarms are all over Boston. The red globe lights up when it is dark. It seems to be a handy thing to look for rather looking for a pay phone if you don’t happen to have a cell phone. Yea! It was Friday and we rented a car to leave Boston and follow Mass. 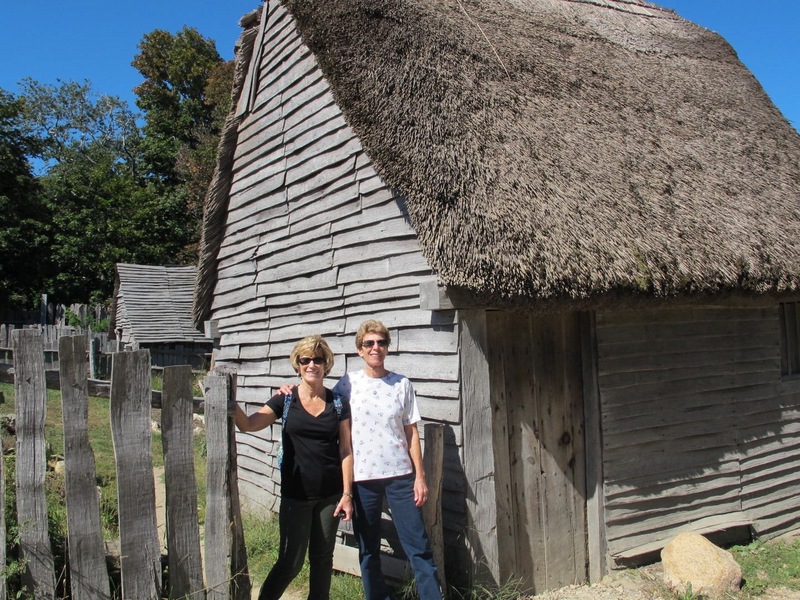 Ave. (what the locals call it) about 14 miles to Lexington and Concord to see where the Revolutionary War’s first shots were fired. 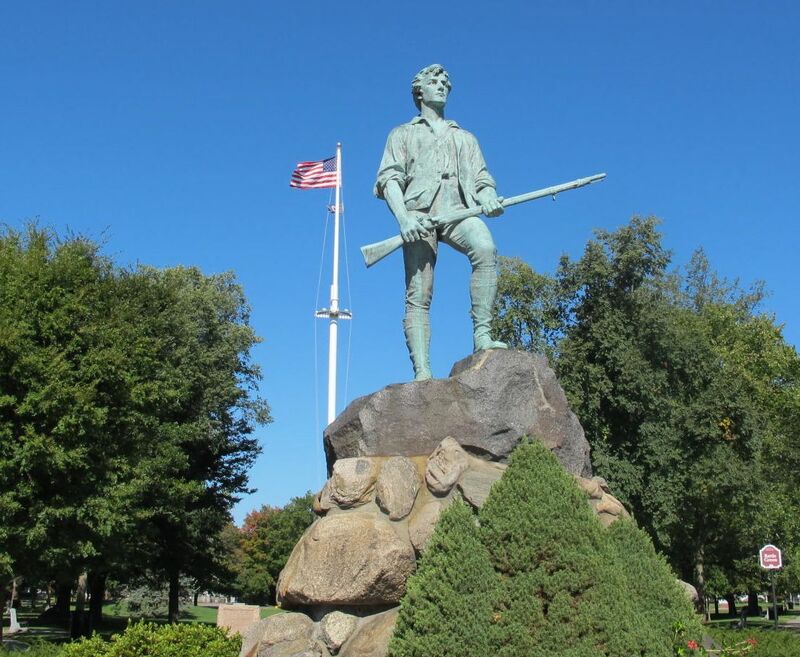 Our first stop was Lexington because that’s where the British first encountered the Minute Men on the Lexington Green. Shots were fired but it’s not clear if the Colonists returned fire. So there is a controversy about exactly where the Colonists fired first to begin the War. The contrast between Boston and the outlying areas (even if it was only 16 miles) was dramatic. The pace of life is more leisurely and QUIET. There were no sirens, horns or other disturbing noises. We were quite happy to enter this area, as we seem to be country folks now and not used to the hubbub of a metropolitan area. 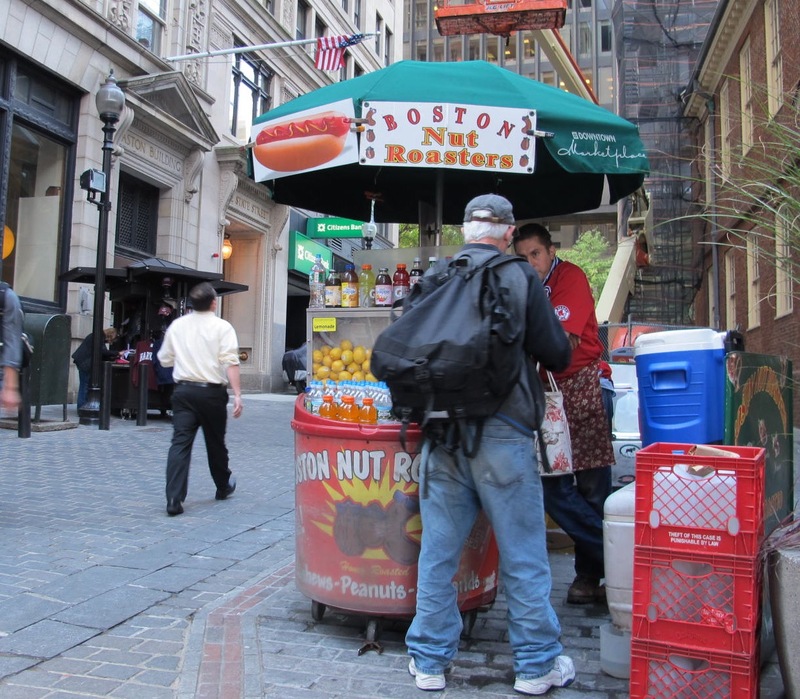 We really enjoyed Boston’s history and many of its people, but it was too frenetic for us. Mass. Ave. is the basic road the British marched to Concord to seize a cache of ammunition from the colonists. Part of the original trail is still visible and is now part of the Minute Man National Historical Park. There, we were intrigued by a short multimedia introduction to the events of April 19. 1775. 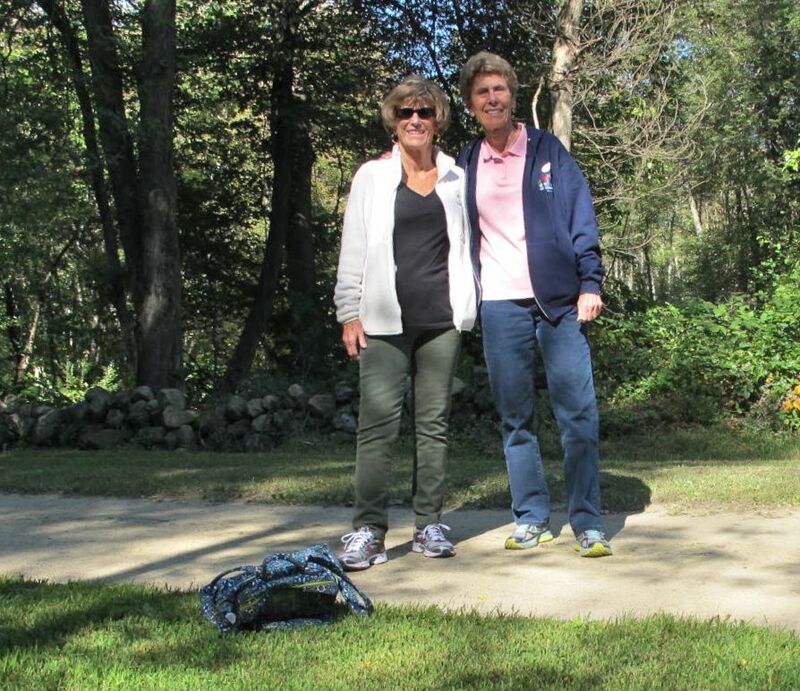 Jerri and I are standing on the road, which was bounded on either side by a short stone fence. I think it was about 30 feet wide most of the way. Today, it’s a bike/jogging trail of several miles. Quite a few people were using it while we were walking on it. You might be wondering when the funny stuff will happen with Jerri and me. Believe it or not, we didn’t get trapped in any building, didn’t fall in a river, or basically didn’t do anything too stupid. I know this is a shock to all of you who have followed our adventures. The only thing that happened was that Massachusetts’ signage is the pits and it’s difficult to figure out exactly where one is. We made quite a few u-turns and recalculations. 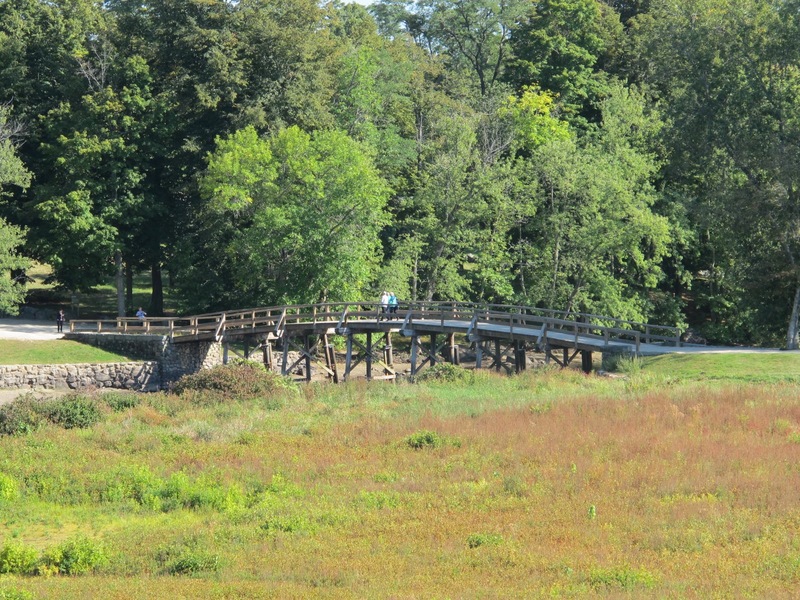 Our next stop was the North Bridge that the British needed to cross to get to the weapons they thought were stored in Colonel Barrett’s barn. It seems like an unlikely, small place at which to begin a war, but this was where “the shot heard ‘round the world” was fired. Another amazing thing is that the British marched out to Lexington, engaged in a battle and then went on to Concord, engaged in another battle and then returned to Boston while being harassed by the Colonials all the way. Those hardy troops marched more than 32 miles and fought, all in less than 24 hours. Concord was fun. We visited the Sleepy Hollow Cemetery (no relation to the Headless Horseman) where authors such as Ralph Waldo Emerson, the Alcotts and Nathaniel Hawthorne are buried (plus many other people). I think we almost got locked in there as it was dusk, but we escaped in time to go to a tasty dinner at the Colonial Inn, built in 1716 and still going strong. 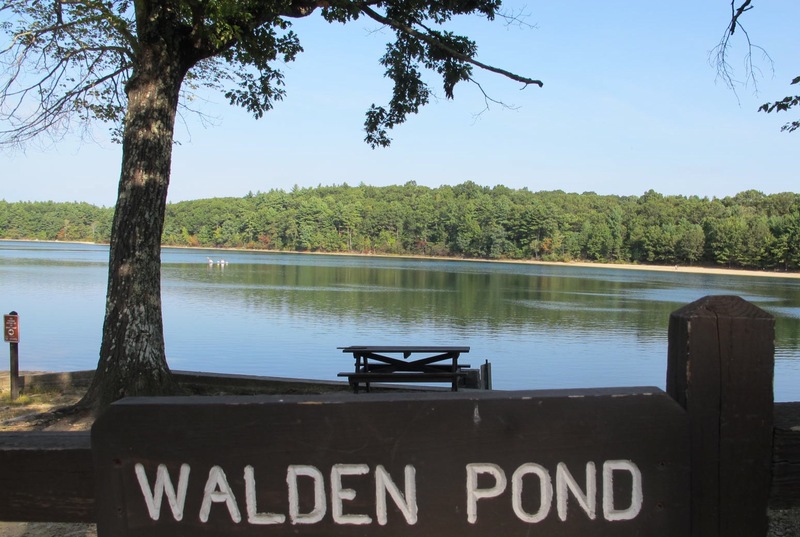 The next morning, we drove by Walden Pond. What a beautiful place! I can see why it inspired Thoreau. You can see how serene it was that day. Some people were canoeing and others were swimming. We were wondering what type of polar bear he was because it was early in the morning and quite brisk. There is a nice trail around the pond and we checked it out. 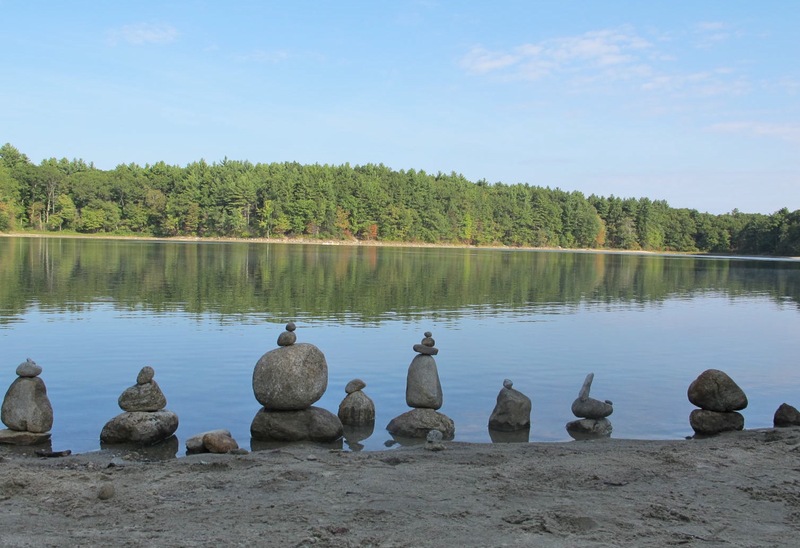 Someone stacked some stones at the pond’s edge, just waiting for my photo. I thought it was pretty neat. From this tranquility, we drove south to Fall River, home of Lizzie Borden. Wow! 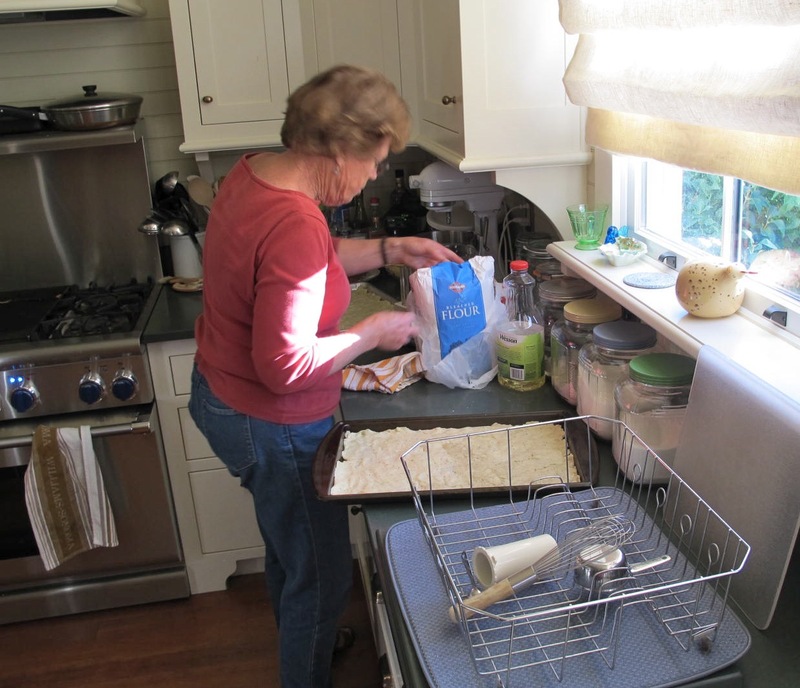 We toured her home where she was accused of taking 40 whacks to her father and step-mother and then acquitted. It’s a violent story, one that seems difficult not to convict, but, then, I wasn’t on the jury. Maybe the axe didn’t fit her hand or something. The house is now a B & B and one can spend the night if one dares. Many folks, apparently, have given up and left in the middle of the night because the spirits were bothering them. 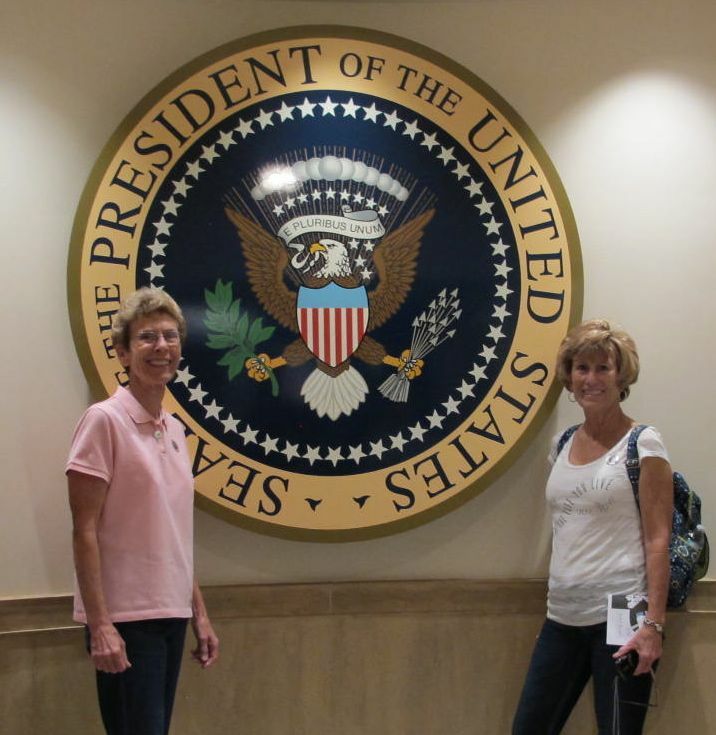 Jerri originally wanted to spend the night, but changed her mind after we took the tour. The next stop was New Bedford, a once great whaling port. 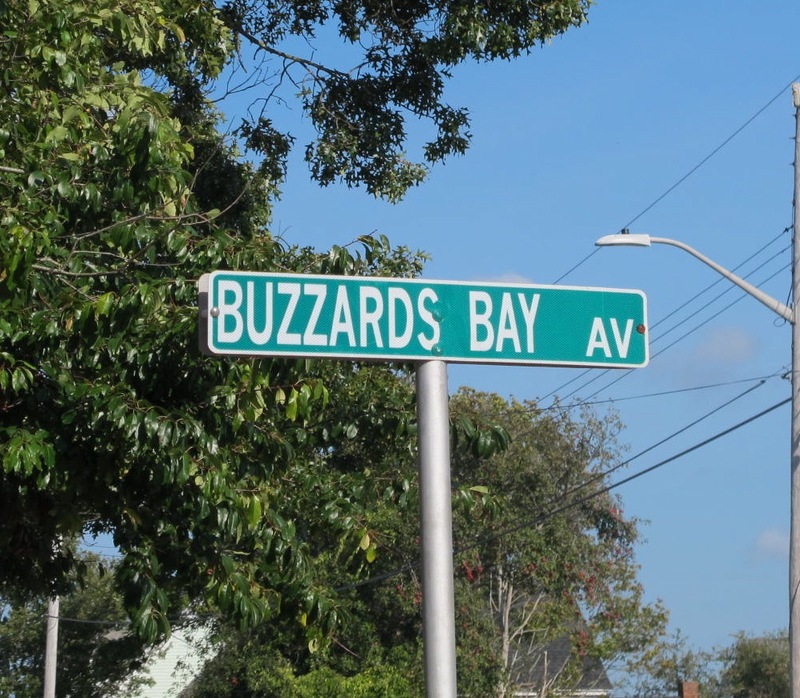 The best part is that is it on Buzzards Bay (some of you may know that one of my nicknames is Buzzard). We were hoping to score a sweatshirt or something with Buzzard’s Bay imprinted on it. No such luck. We did discover the Buzzards Bay Coalition that is dedicated to keeping the bay clean from icky things. But, alas, they were closed until Monday and we were there on Saturday. 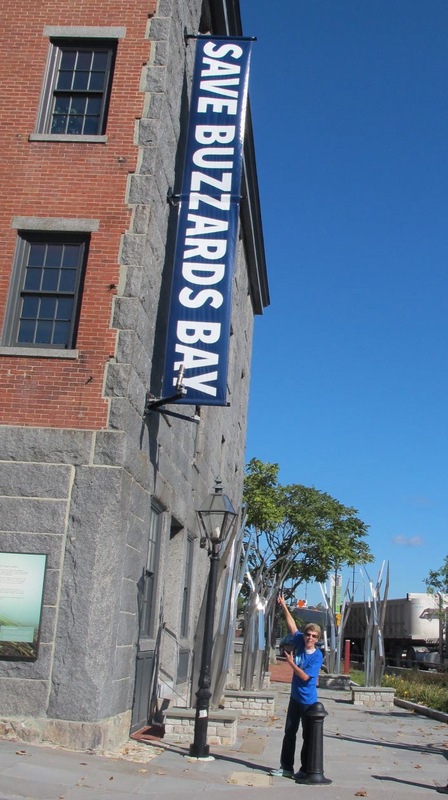 There is also a Buzzard’s Bay Brewery in the area but they were also closed until Tuesday! A bummer all the way around. 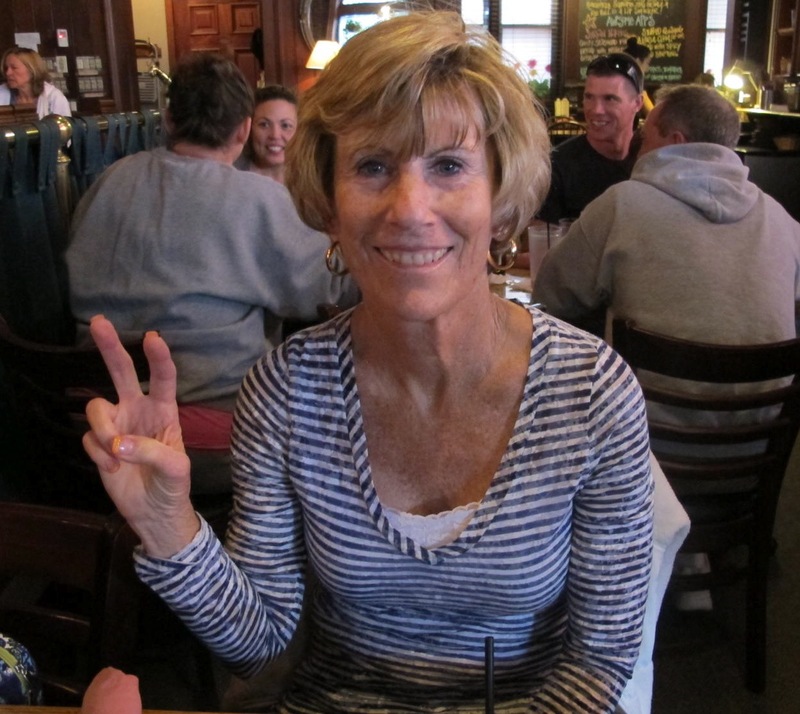 But we did have a great lunch at Freestone’s Tavern that is housed in an old bank built in the 1800s..
Then we zoomed on to what we thought would be the coup de gras of the Buzzards Bay quest…the little town of Buzzards Bay, population3859. Well, guess what, no shirts, no sweatshirts, not even a nice Buzzards Bay welcomes you sign. I guess it’s too small for such frivolity. This street sign is the best we could do…and it was just a little side street barely bigger than an alley. At that point, we vowed to go back to New Bedford and visit the Coalition place on Monday. In the meantime, we would visit Cape Cod the next day. 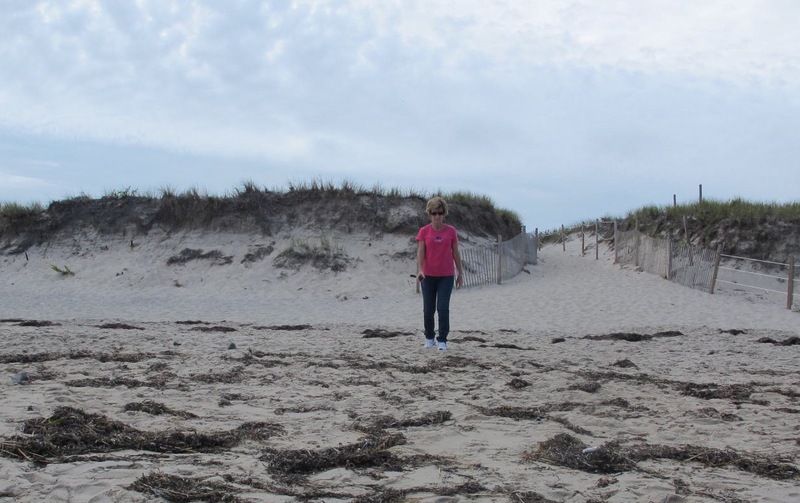 Cape Cod is a beautiful place that must receive thousands of visitors all year long…picturesque sand dunes, villages and parks. We really enjoyed our drive. 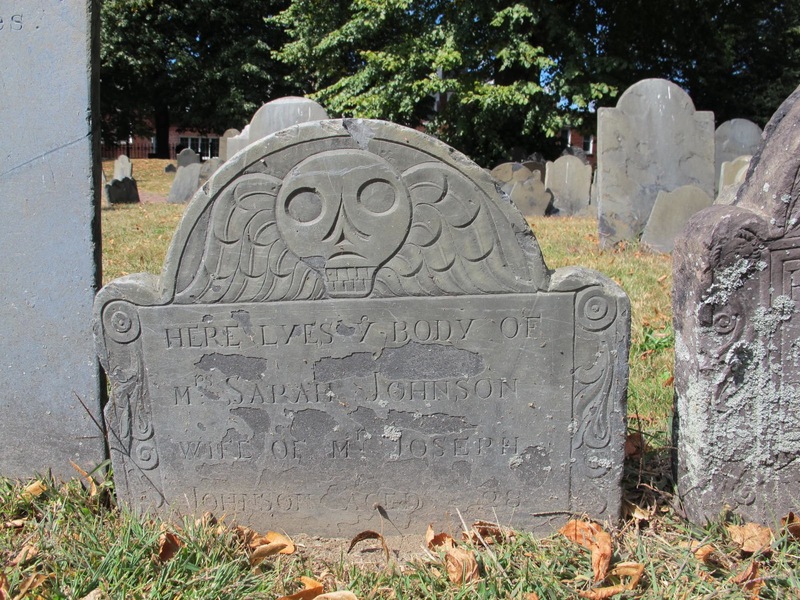 We happened to espy yet another graveyard and what should be pecking around on its perimeter? 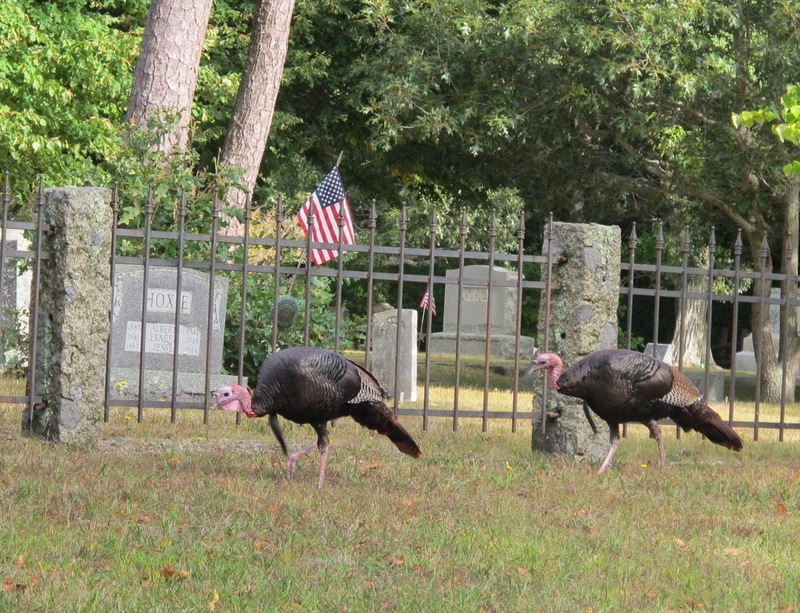 Yep, some turkeys. They are all over the place in Massachusetts. I wonder if these birds are as tasty as the farmed ones that we buy for Thanksgiving? Here is Jerri on the sand dunes as we visited a beach. It was cloudy all day and threatening to rain, but we still thought it was pretty. I don’t know if it would be real humid in the summer time. That might be a deal breaker for me. These dunes have a very fine sand, unlike sand on the west coast. We visited the little town of Chatham that was delightful. It would have been nice to visit it on a sunny day. We also visited Hyannis to see what we could see. 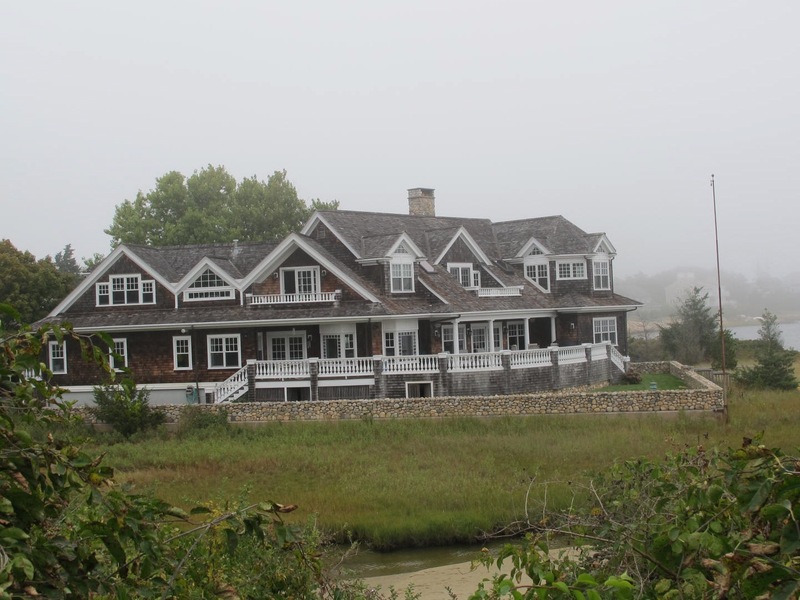 This is a house on the Hyannis shore. Just a small summer cottage? 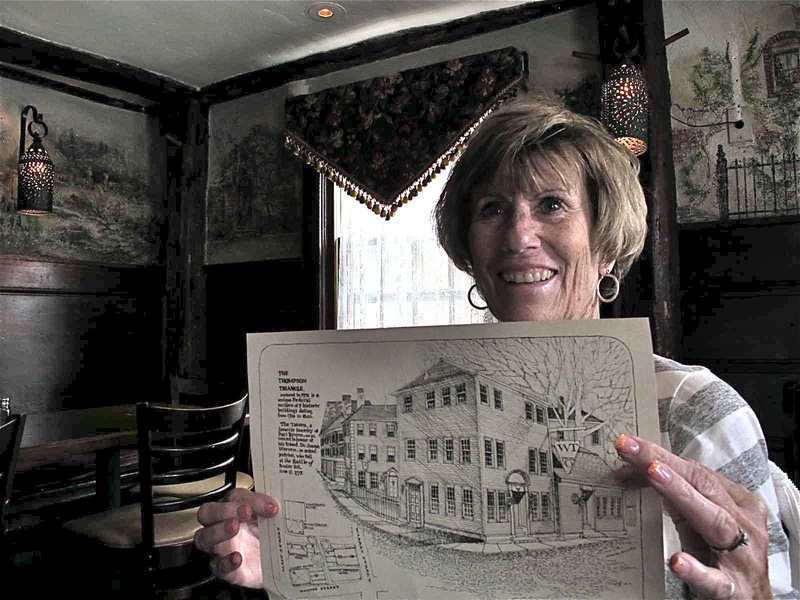 It was right beside a small memorial for John Kennedy, but was not where he stayed in Hyannis. Just a little summer house? We motored back to New Bedford the next morning in hopes of scoring some good Buzzards Bay stuff. It turns out that they didn’t have much because of the pending winter and things are beginning to shut down. We bought some t shirts and found it very interesting to talk to the volunteers at the Coalition and learn about watersheds and so on and why they are trying to “Save Buzzards Bay.” We also learned there aren’t many buzzards in the area, but the Pilgrims thought the numerous ospreys in the area were small buzzards. Hence, the name of Buzzards Bay. The Buzzard saving the Bay! We weren’t able to visit the brewery, but we did have dinner at a place that served the brew. It was ok but not the best ale I’ve ever consumed. The best part was when the bill was delivered. Finally, a real buzzard logo! Many of you know that Massachusetts is a primary producer of cranberries. It so happened that we drove through the primary cranberry bogs (except they weren’t bogs yet) on our way to Plymouth. 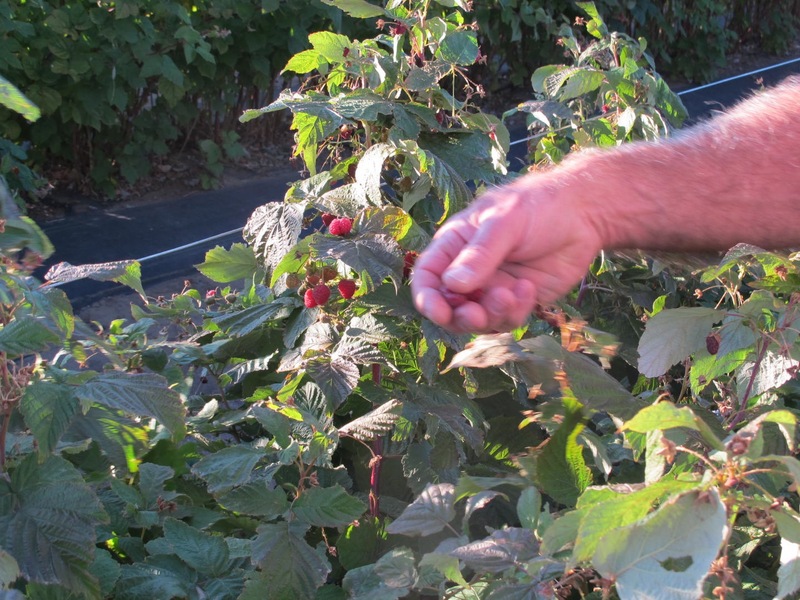 When the berries are ready to be harvested, the fields are flooded thus making the berries float and easier to gather. 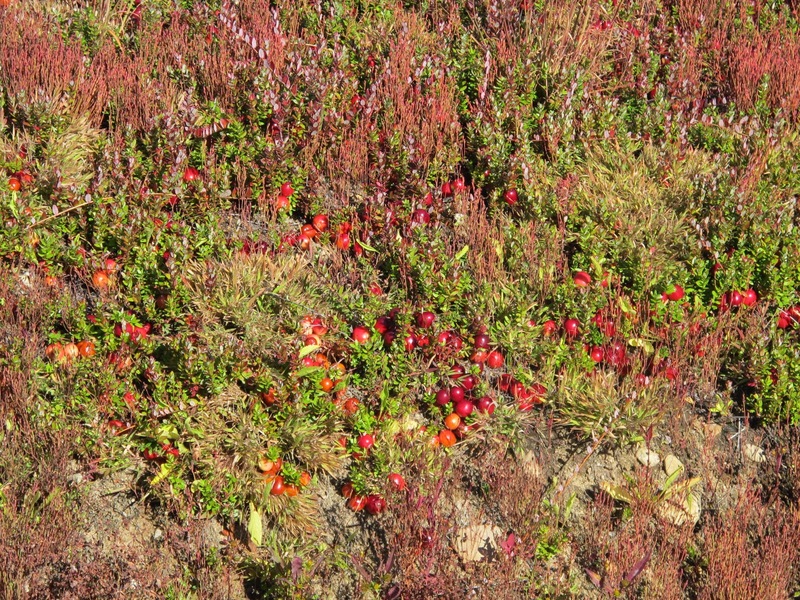 These cranberries don’t look real tasty yet. Plymouth is a fun little town with much to see. 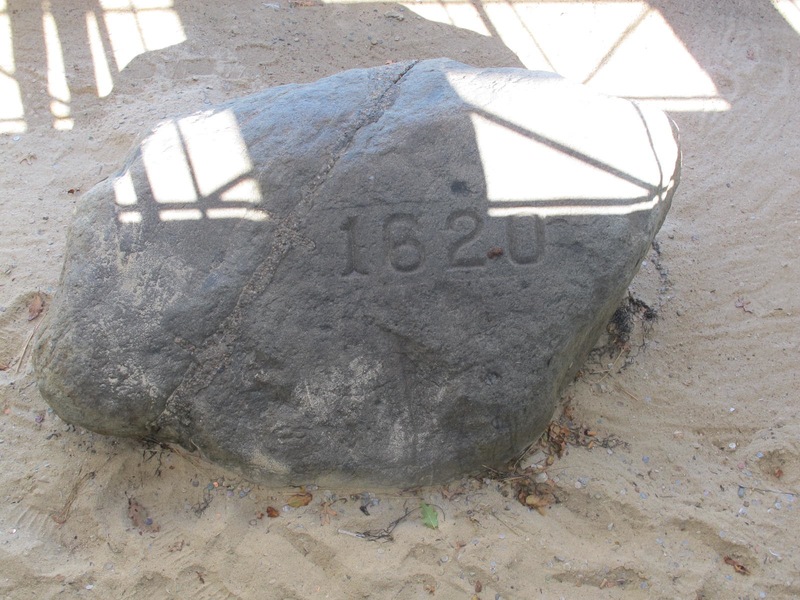 There is the Plymouth Rock, encased in its portico for safekeeping, the Mayflower II, Plimouth Plantation, a Wampanoag village, cute shops, the Pilgrims’ Burial Hill and many more places to explore. We did it all! I think the Rock is protected because too many people would want a piece of the Rock (so to speak) and it is already a shadow of its original self. So, all you can do is take a picture even though the sun is NEVER right for it. 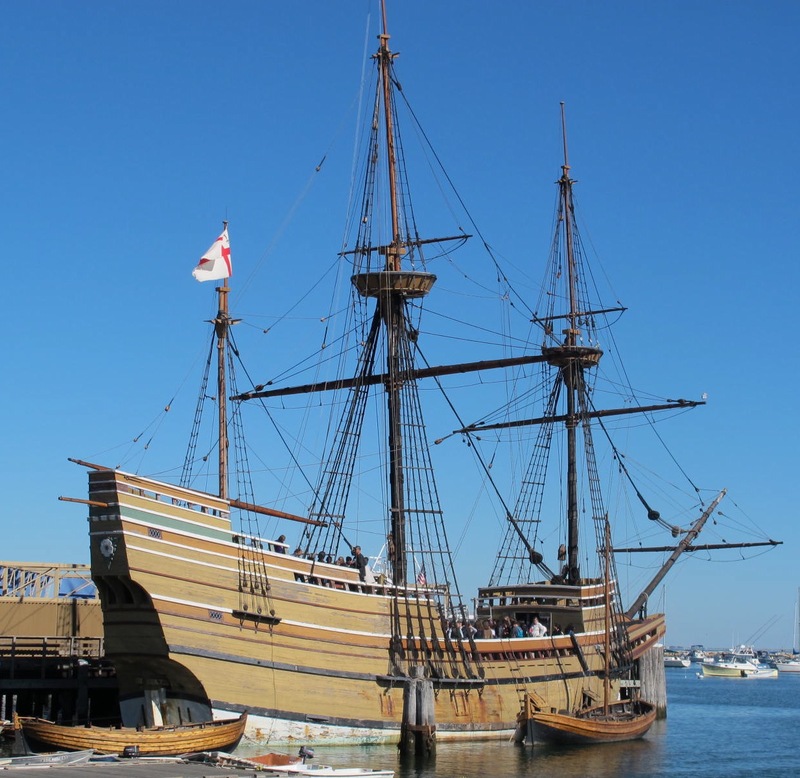 The Mayflower II is an exact replica of the original Mayflower. It’s amazing to me that any of the Pilgrims survived their voyage unscathed. 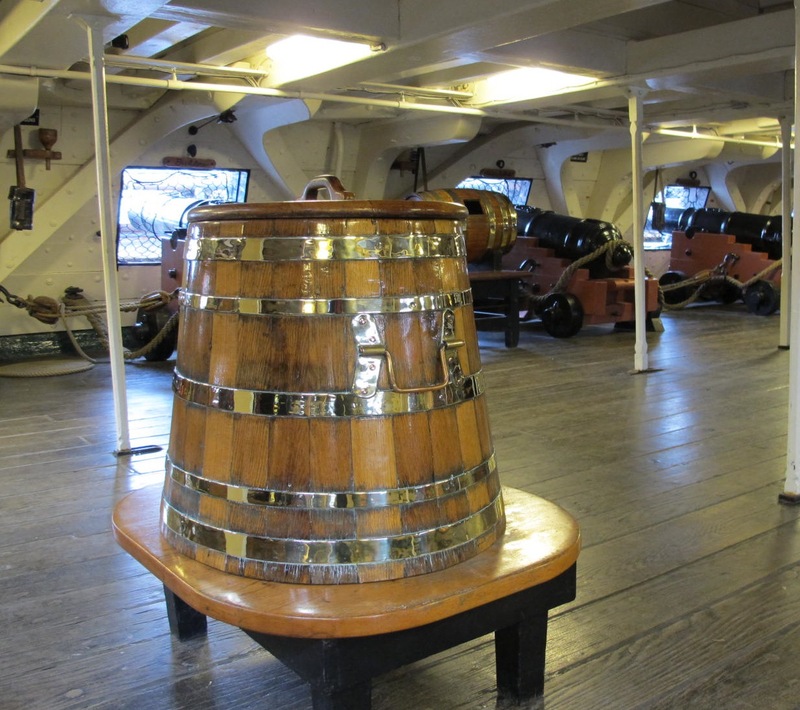 All 102 Pilgrims and their livestock were kept below decks for the entire voyage. That would not be a pleasant experience to say nothing of being weak from seasickness and then having to go out to build homes in December at Plymouth. It’s no wonder that half of them died during the first winter. 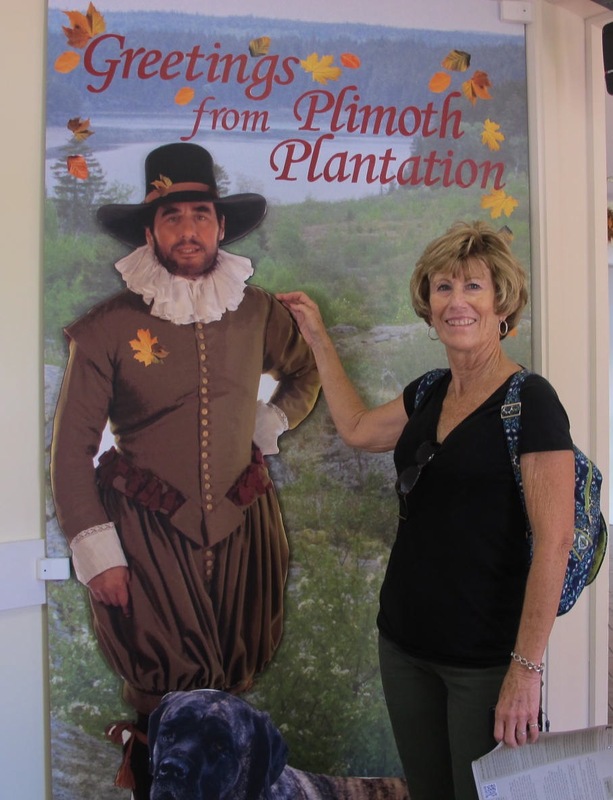 After visiting the Mayflower II, we drove out to Plimouth Plantation, a living history museum that contains a Wampanoag homesite (local Native Americans) and a 1627 colonist village with homes, barns, gardens, and a fort. Visitors are free to ask questions and learn as the inhabitants go about their daily routines. 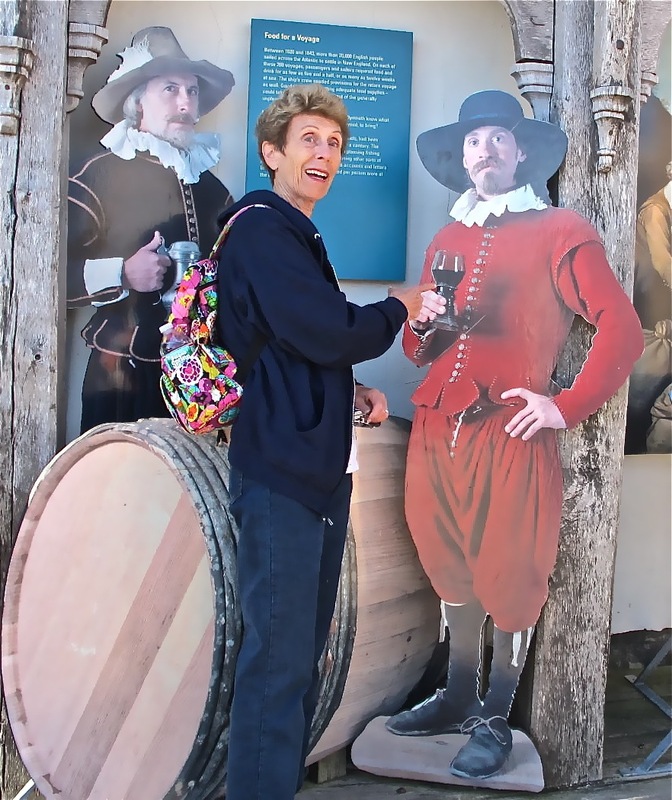 We thought it was a great experience to talk to these folks and learn about their 17th century cultures. 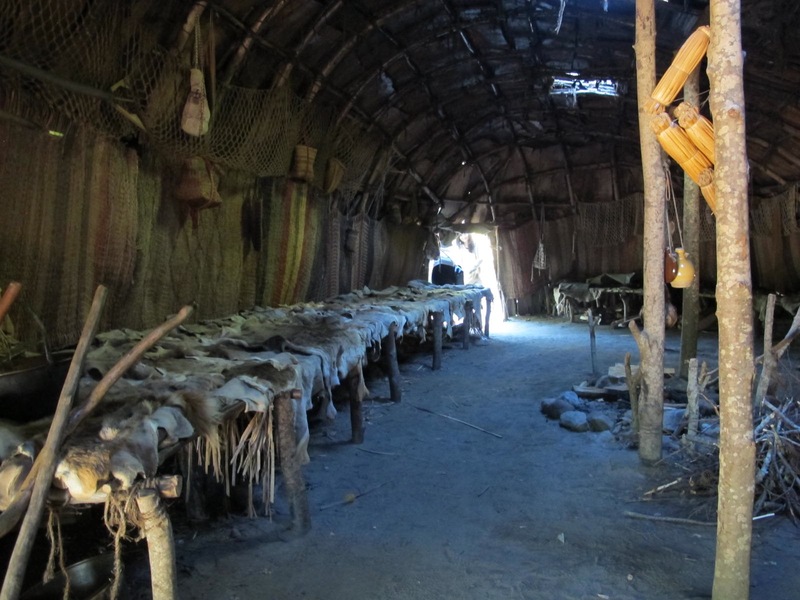 We were able to enter the Wampanoag dwellings and learn that while they were pretty efficient for their time and probably would have been warmer than the Pilgrims’ houses. They used bench type affairs for beds that were made comfortable with animal pelts. The dwellings were used primarily for sleeping and storage while most activities were outside. The Wampanoags wore long pants way before the Pilgrims did. I suppose there were stubborn people on both sides who did not want to learn from the others. We were free to go into each of the houses and talk with the inhabitants and find out what they were doing. 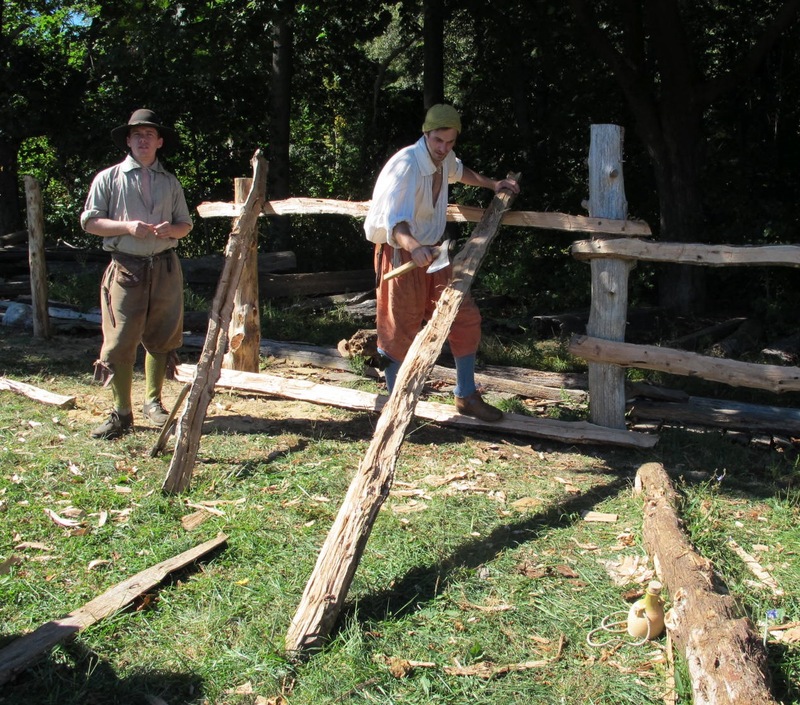 These fellows were hewing logs for a fence. During our last morning in Massachusetts, we drove around some local villages. They are so pretty being nestled in nooks and crannies of big and little bays. 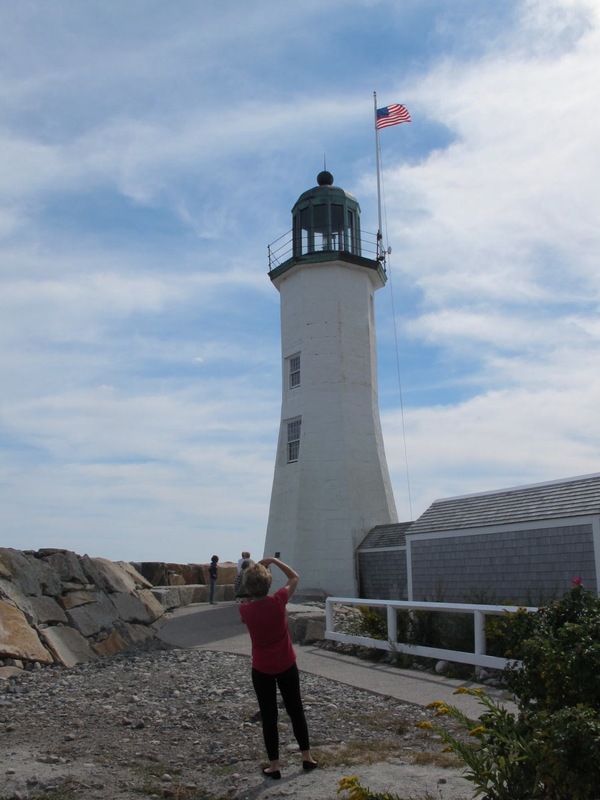 We visited Scituate, which has a lighthouse dating from 1636 (at least that’s what the sign said). Congress voted money to refurbish it in 1810 and that was done. 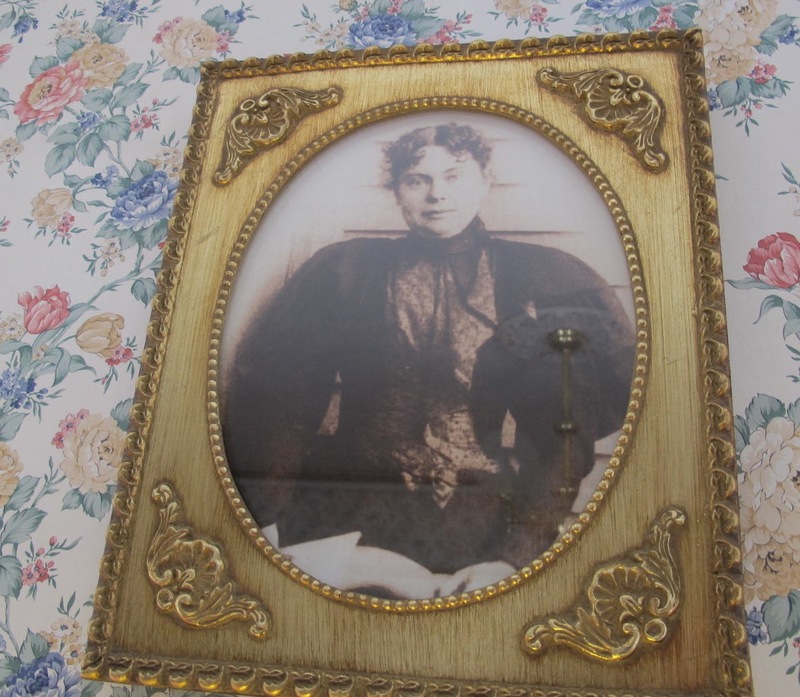 During the War of 1812, Abigail and Rebecca Bates, daughters of the lighthouse keeper, played a fife and beat on a drum to frighten away a British naval force who planned to sack the town. The girls have gone down in history as an army of two! From there we successfully drove back into Boston the Logan Airport. Jerri navigated and I drove. We were pretty excited that we made it to the rental car return without being honked at. Jerri yelled at me when I almost missed a turn, but we made a pretty good team in returning the car without any mishap. 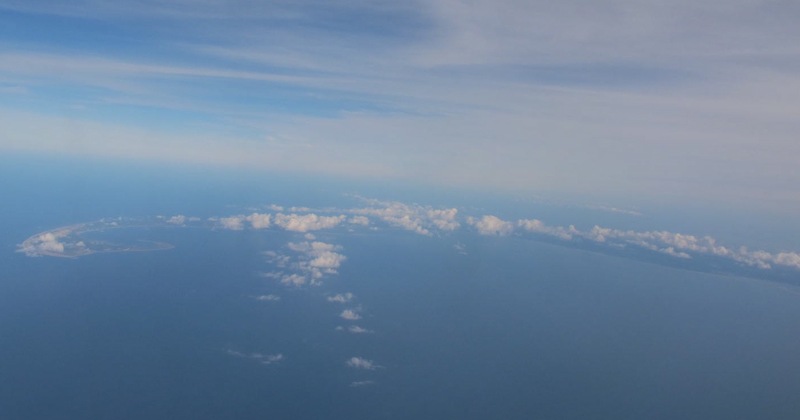 Jerri took this next picture from the plane as we flew over Cape Cod. We knew it was big, but seeing it from the air made it seem even bigger. Follow the clouds and that’s where the Cape is. It was so good being together on this trip and enjoying each other’s company as well as the many sights available to us. I know some of you are disappointed that we didn’t get into more trouble, but maybe next year. We’re already planning next year’s trip which will not be to the East Coast but rather to our own Southwest and we hope that proves to be as much fun as this one was.